I have to admit I have a few strange habits and one of them is taking pictures of certain things or places that most people probably don’t. 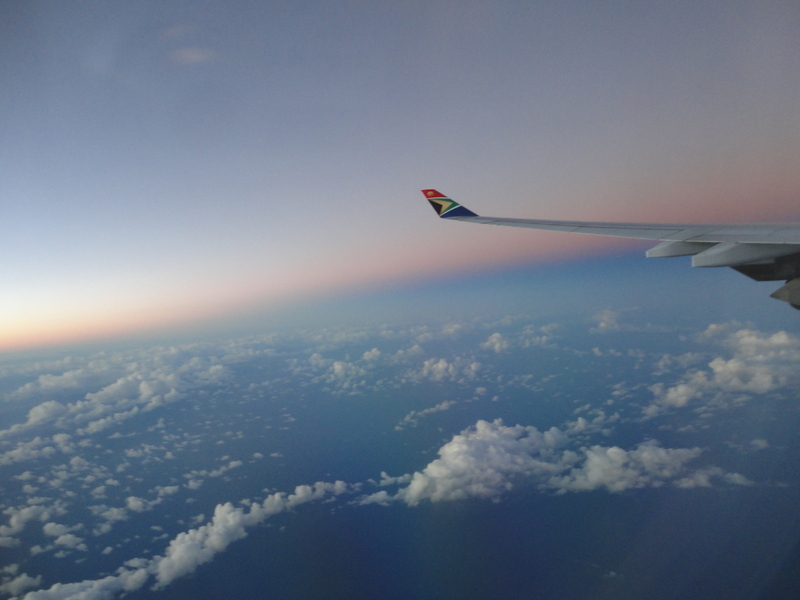 I especially indulge in this habit whenever I fly as I take photos of airports, the skies or the places below from the plane, and even planes from time to time. I had to fly to Taiwan last week, just months after my last visit due to the need to get a minor but important medical operation. It’s kind of a hassle to fly when it’s not for a vacation such go through security and transfer flights but it gave me a chance to take a few interesting photos. And of course, going to Taiwan regardless of the reason lets me be in a more healthier and polite society. And enjoy faster and uncensored Internet and a very open media environment. These photos below are from last year. 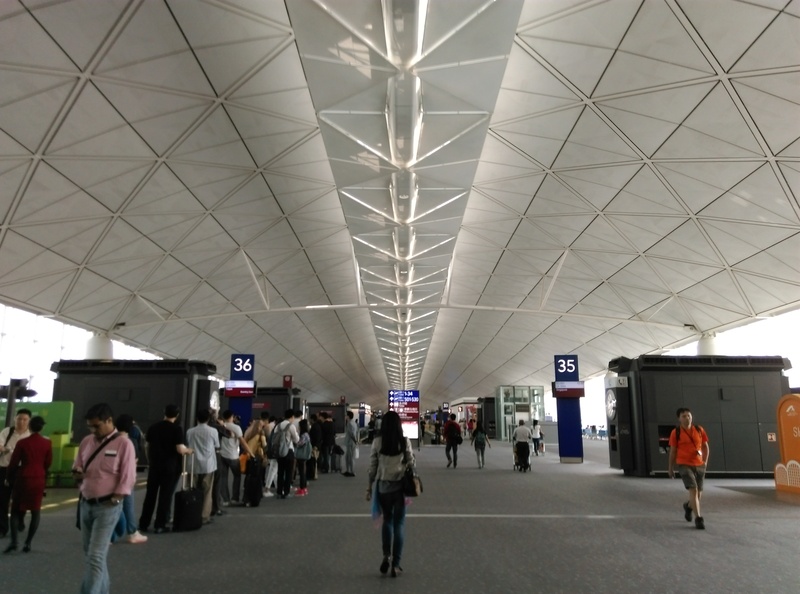 The roof of the terminal, not the lady, is what I took a photo of, though she’s a fine addition to the picture of Hong Kong Airport. This photo of Hong Kong might look like it was taken two decades ago, but this was actually last October. 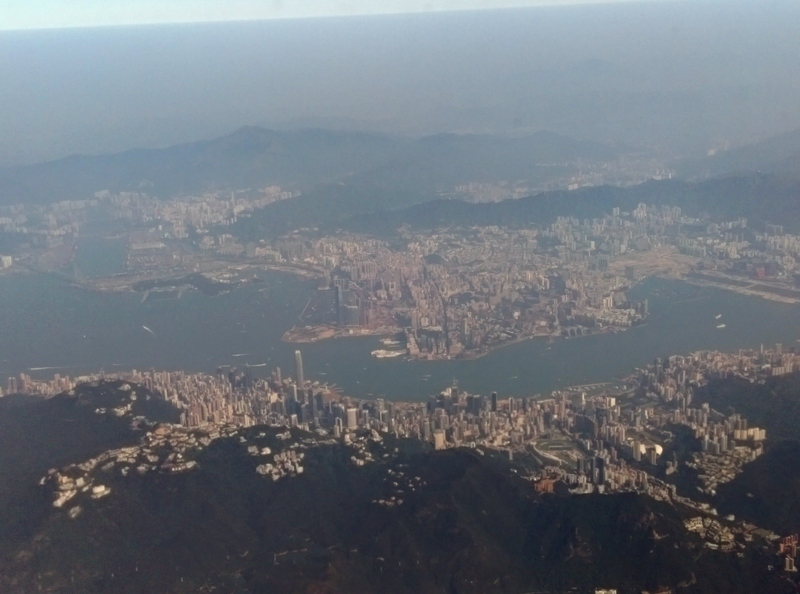 You can see Kowloon on the top in the middle, and Hong Kong Island’s business districts opposite Kowloon on the other side of the channel, especially the IFC tower jutting out amid HK’s other skyscrapers (it’s also my favorite HK tower). 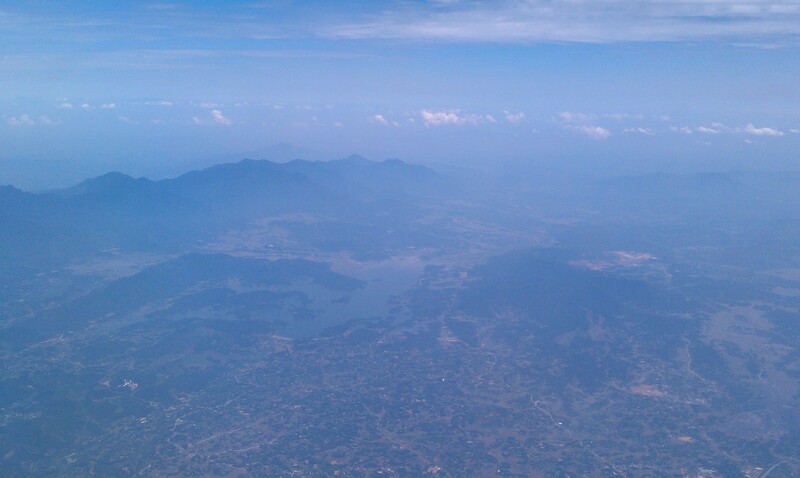 The Occupy street protests were going on so I was even trying to see if I could spot it from the plane (I couldn’t). After Vietnam and Cambodia, it was time to go to Thailand, specifically Bangkok, the world’s most visited city and famous for different ways. I’d spend my last 5 days in SE Asia there and return to Taiwan. To be honest, I didn’t have high expectations since I just never was really interested by Bangkok. Yet I ended up being disappointed. From the start, I experienced a series of problems and I had a negative vibe about the place. Bangkok’s modernity made it seem like a shabbier Taipei or Hong Kong, and not as charming or interesting as Vietnam’s cities, which had a more traditional and bustling feel to them. 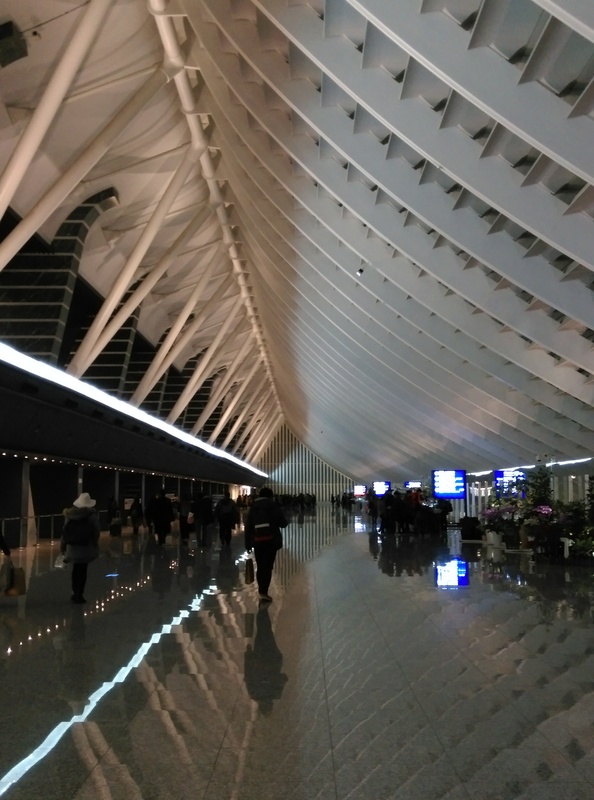 There was a striking contrast with Bangkok’s gleaming modern façade, such as its grand Suvarnabhumi airport, and its on-the-ground reality. Perhaps the fact I’d already been on holiday for over 2 weeks in a region I’d come to for the first time also added to my irritation. Perhaps if I’d have gone to other places in the country besides Bangkok, I’d have had a better time too. Interestingly, I wasn’t the only person who disliked Bangkok. Weeks earlier, when I was in Halong Bay, I met an Italian and her Indian boyfriend who were expats in Shanghai, and when she heard I was going on to Bangkok, she’d said she hated Bangkok. Of course, I know many people love Bangkok and the city does have some good aspects. I left Siem Reap in the morning, taking a tuktuk for the half-hour drive to the airport driven by the same man who’d taken me to Angkor on my second day. At my hotel, while waiting for him, I saw a small noisy gathering down the street, a political convoy of supporters of the ruling party ready to hit the road. Election season was in full sway and the ruling party would go on to win, though not without some controversy. Another driver had come in to pick up another guest, one who I’d hired to go to Angkor on my third day. I asked him about the ruling party and he scowled, shaking his head to express his disapproval. At the same time, the manager of the hotel or villa saw me off, a nice Vietnamese lady who was kind enough to exchange my remaining Vietnamese dong for US dollars. My driver eventually came and off we went. The Siem Reap airport was a small modern attractive airport, reflecting the tourism boomtown Siem Reap was. I don’t even think the terminal was two stories. 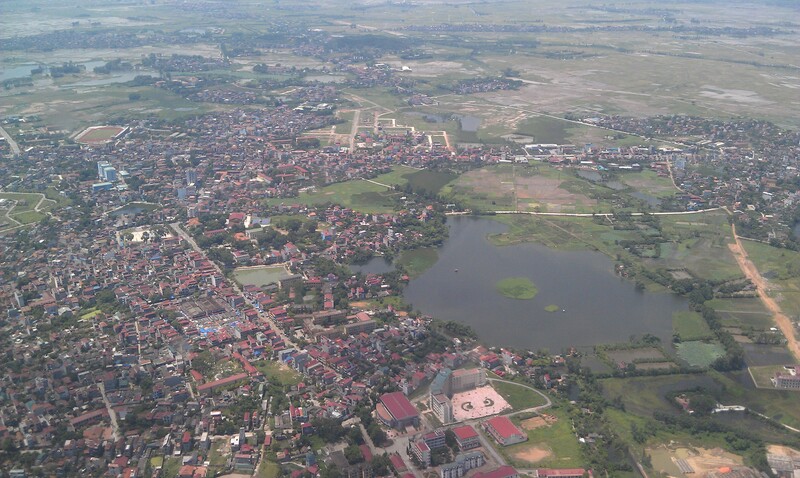 My check-in went smoothly and before long I was on my way to Bangkok via Cambodia Air. At the airport, I saw a girl who was among the Chinese staying at my friends’ hostel (those guys were also going to Bangkok on the same day but by bus) and she had a distraught look. I went up to her and learnt she’d mistaken her flight date so she was heading back to Siem Reap from the airport. I guess you’ll see those guys again before they leave, I said. No way, I’m going to another hotel, she said. I don’t want to see those guys, it’d be too embarrassing! Another mildly amusing exchange happened in the waiting area when I went to a shop to buy a newspaper as a souvenir (it’s strange but I do like to read and compare newspapers from different places). However, not only did the store not have that day’s paper, it didn’t have the previous day’s. The newspaper on display was from 2 days ago. And I bought it, since I was so desperate for a local newspaper. 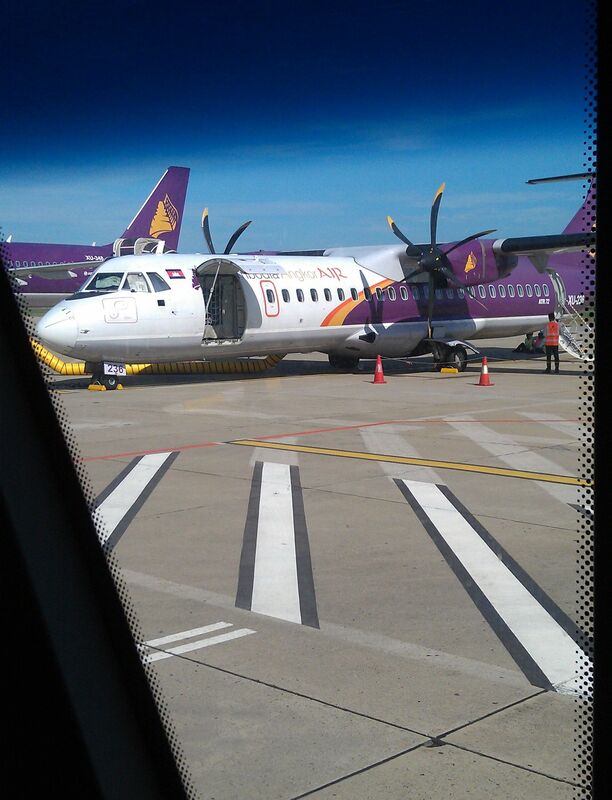 I flew Cambodia Angkor Air, as it was the cheapest available option, not that there were many from Siem Reap to Bangkok. 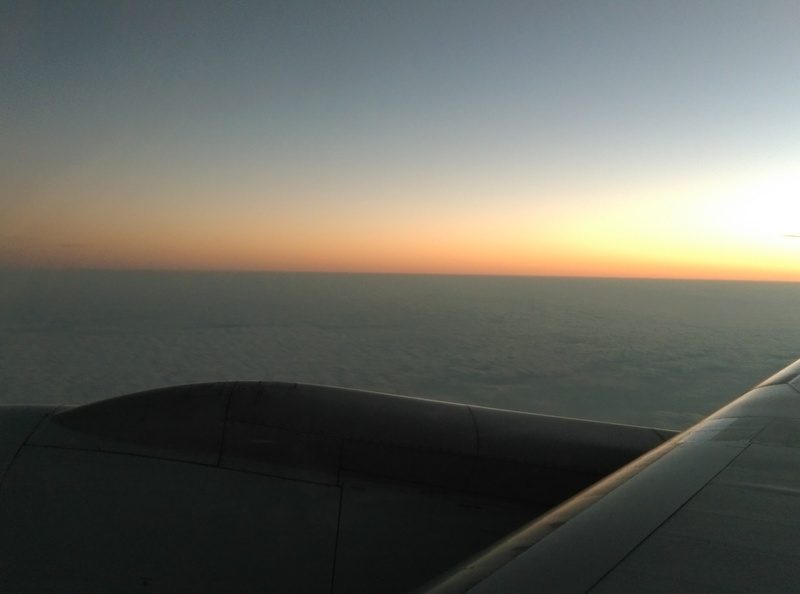 The plane was a small, single-aisle turboprop jet and the service was decent, and the flight attendants elegantly dressed. As with the Mekong Express long-distance bus service, I had another pleasant experience on a Cambodian transit company. 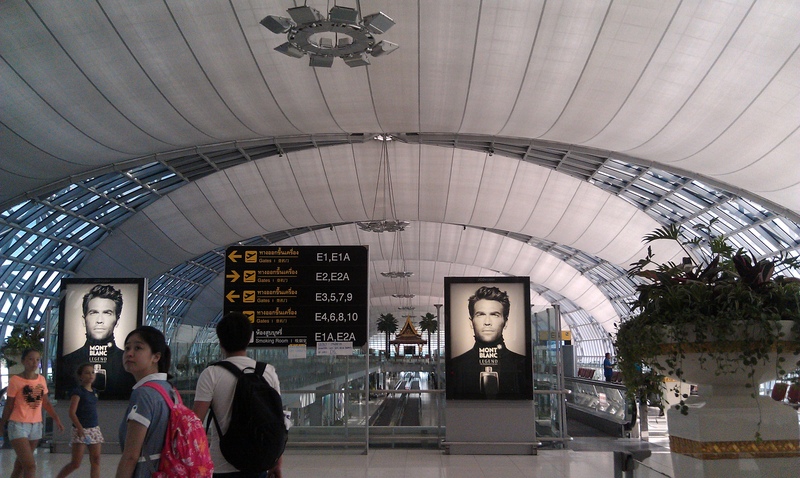 After the short one-hour flight, I arrived in Bangkok’s fancy airport and took the airport train to a station. I mulled transferring to the subway to get to my hotel, but I decided to take a taxi instead. It was convenient as there was a counter, manned by station and not taxi company people, who helped you get a taxi at a special platform where taxis lined up, as if it was the airport. However, this is where things started to go somewhat downhill for me in Bangkok. I’d arrived before noon and unfortunately the traffic was horrible. On Googlemap, the station was very close to my hotel but it took over an hour. The traffic literally crawled at times and Bangkok’s modernity, which was in contrast to Phnom Penh and Hanoi, seemed to be a negative. Also my driver was a gruff middle-aged guy who hardly responded when I greeted him and told him my destination. He seemed unfriendly and ignored me when I asked something about the city. Halfway though, this all changed. I decided to ask him about Thai kickboxing or muay thai at Bangkok’s fabled Lumpini Stadium. As soon as he heard me, his whole demeanor changed and he responded enthusiastically to my questions, even calling somebody to check the times for the event. The driver didn’t turn out to be so bad and that’s the kind of welcome surprise one wants when traveling. However while the driver was cool, other frustrations would loom. I ended up falling asleep and the driver had to wake me up when he arrived at my hotel, which was actually a block of serviced apartments nestled inside an upper-middle-class neighborhood. I was really tired for some reason and slept the afternoon away, before going to said Lumpini Stadium in the evening to watch kickboxing. Before I went to watch the muay thai, I had a really frustrating experience when my camera’s charger couldn’t go into my room’s power sockets. I went down to ask the receptionist and she just couldn’t understand my problem with the power socket. Worried that I couldn’t plug my camera and phone into anything, I went to a nearby 7-11 store to check if they sold adapters. I couldn’t see any so I asked the clerk if they sold it or if there were nearby stores. The guy and his colleague also couldn’t understand what I said, which left me annoyed. Granted there is a language barrier, but I thought English was more widely spoken, especially given Bangkok’s status as one of the world’s top tourist hotspots. I was especially disappointed at my hotel receptionist since she could speak enough English to handle my checkin, and also because my Vietnamese hotel receptionists’ English were quite decent. Eventually the power socket problem was resolved when I pushed extra hard on them with my device power plugs and they went in. The bad noon traffic and the lack of adequate English weren’t terrible problems by themselves, but together these issues, along with others that would happen later, really aggravated me. Some funny stuff happened with the publishing date when I originally posted this so I posted it again. 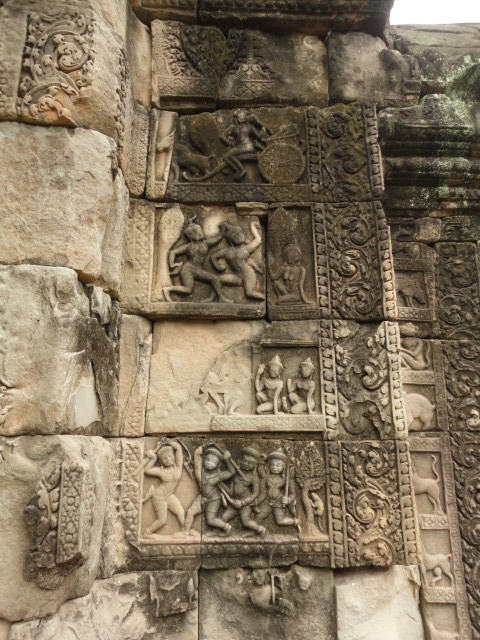 This is a final set of photos of Angkor Thom, the ancient capital city that is the largest site in Angkor. 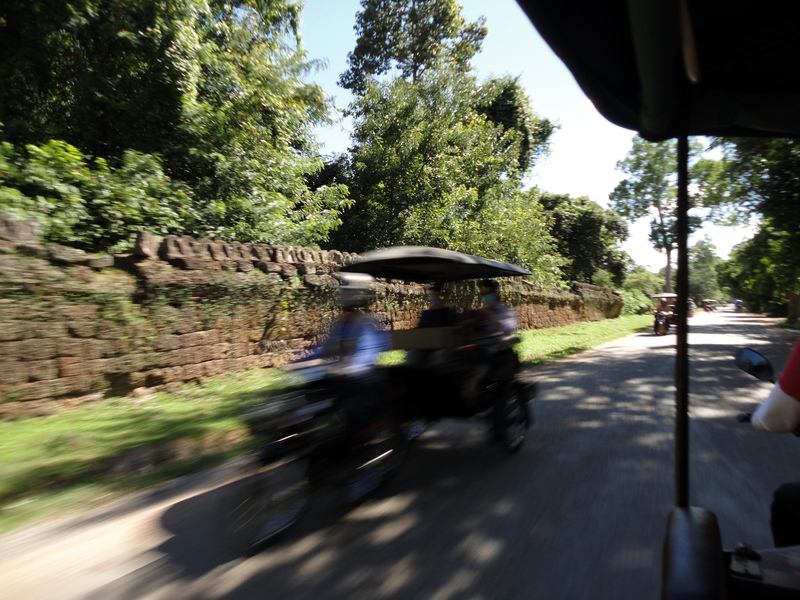 Speeding past another tuktuk on the Angkor expressway (joking). 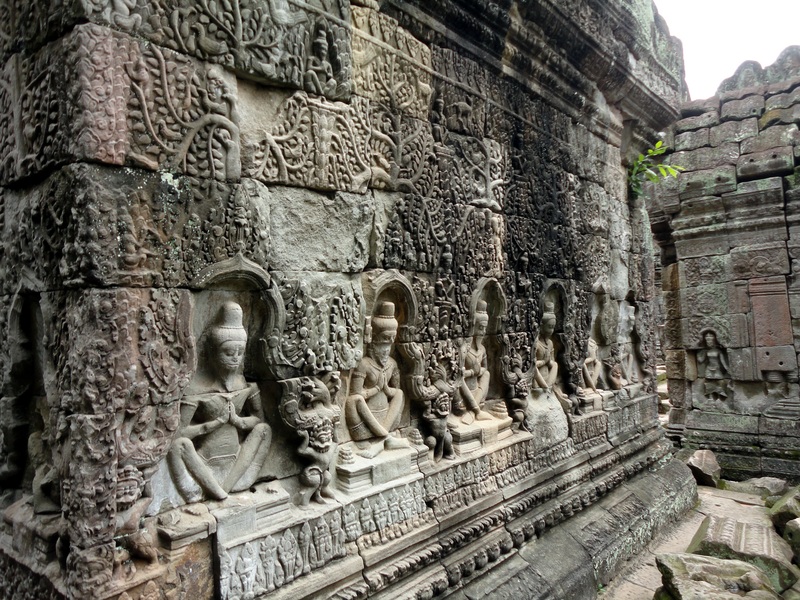 Closeup view of a couple of faces on Bayon. 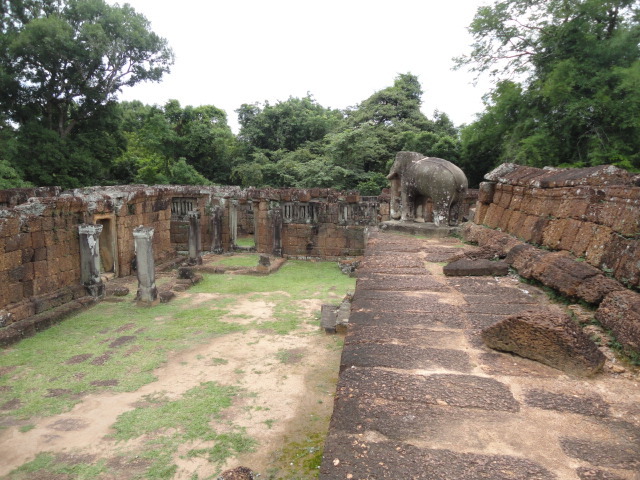 Part of the Terrace of the Elephants. 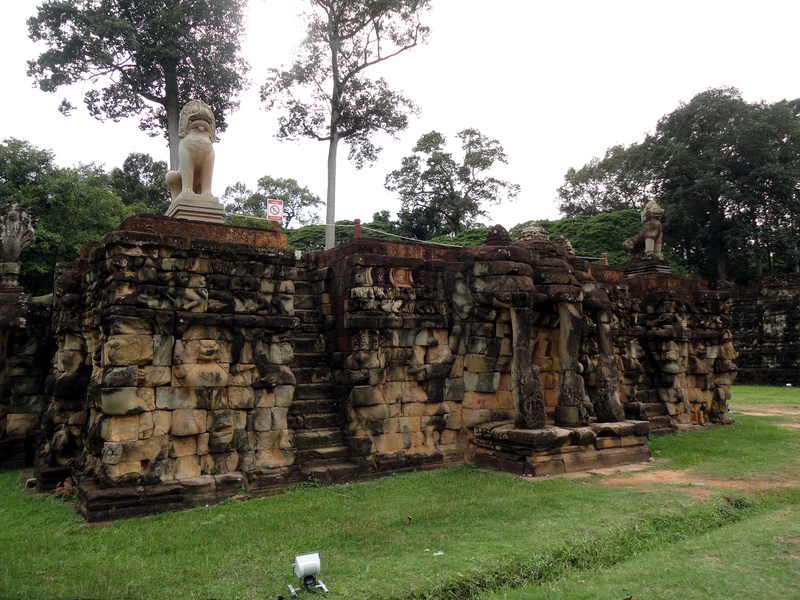 An entranceway through a wall that surrounds Phimeanakas and the Royal Palace, which sadly doesn’t exist anymore. 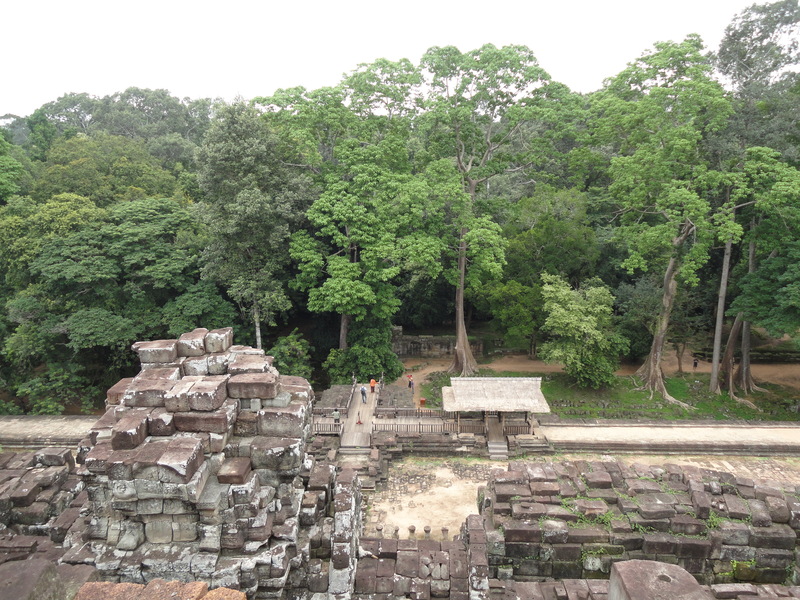 Looking down from the stairs on Phimeanakas. 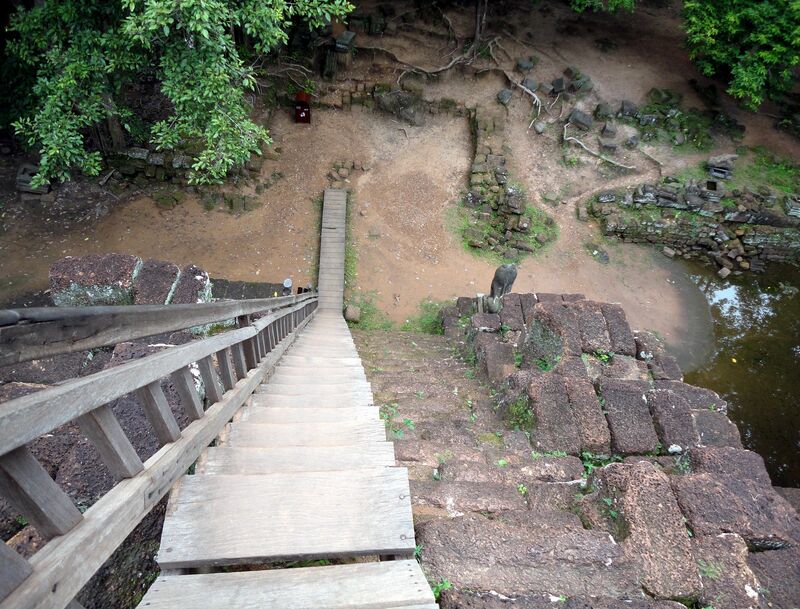 And looking down from the stairs on Baphuon. Totem on top of Baphuon. 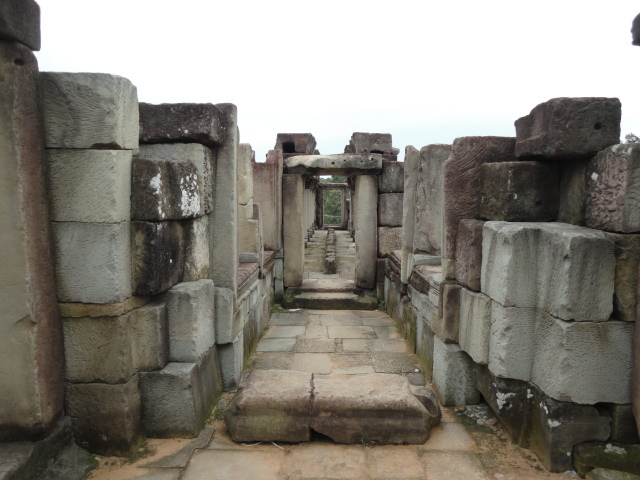 Stone passageway on top of Baphuon. 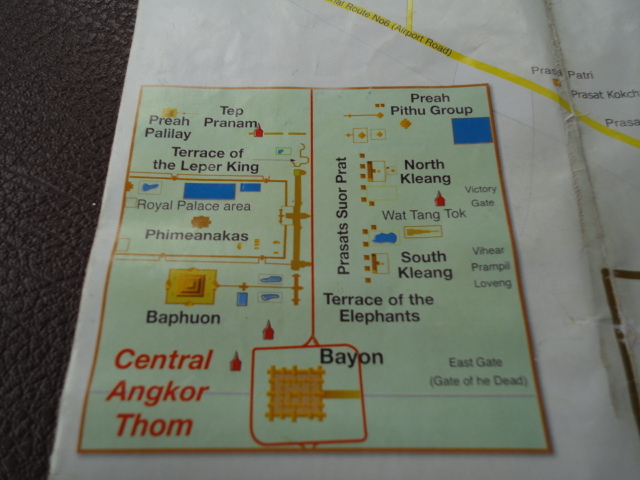 Map of Angkor Thom. I did not explore the sites on the right half as those are mainly small structures. 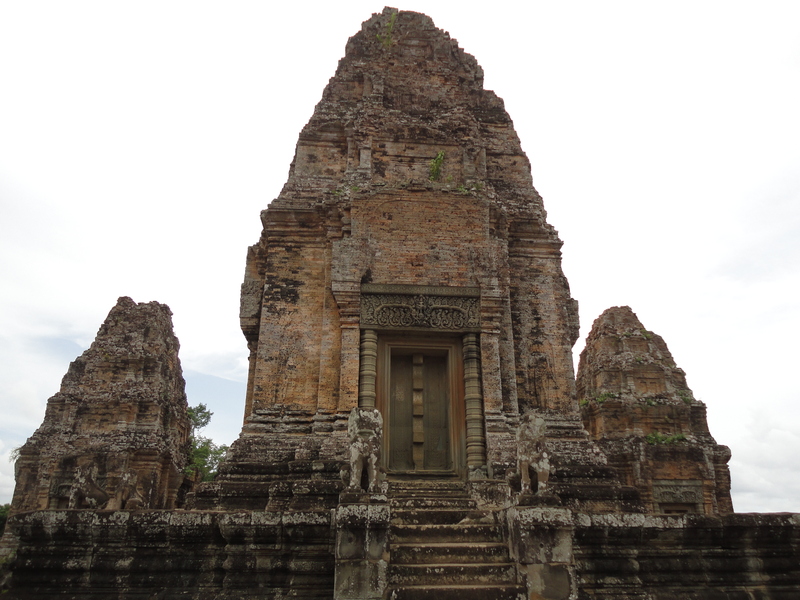 I’m finishing up posting about my trip to Angkor in Cambodia, and I’ve finally come to the great city of Angkor Thom. 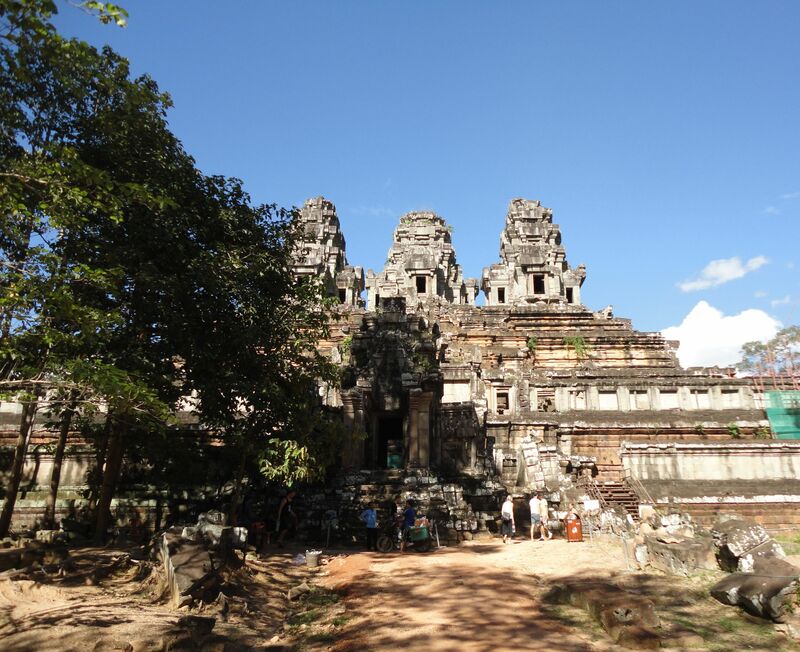 Angkor Wat might be the most famous and impressive complex in Angkor, but Angkor Thom is just as historic and was even more important, given it was the actual capital city where the king resided and ruled from. 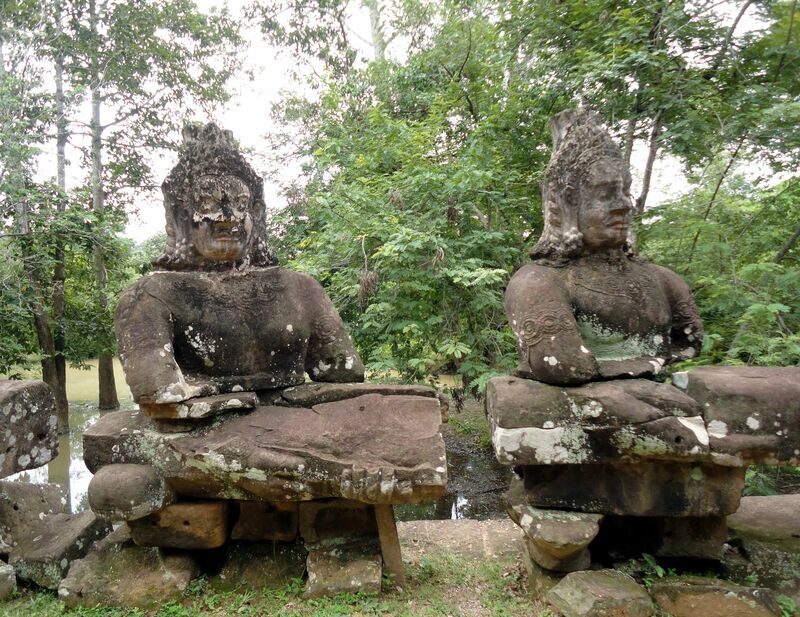 Unlike Angkor Wat, Angkor Thom (Great City in Khmer) is not a single massive complex but a city surrounded by a square wall and moat with many buildings. 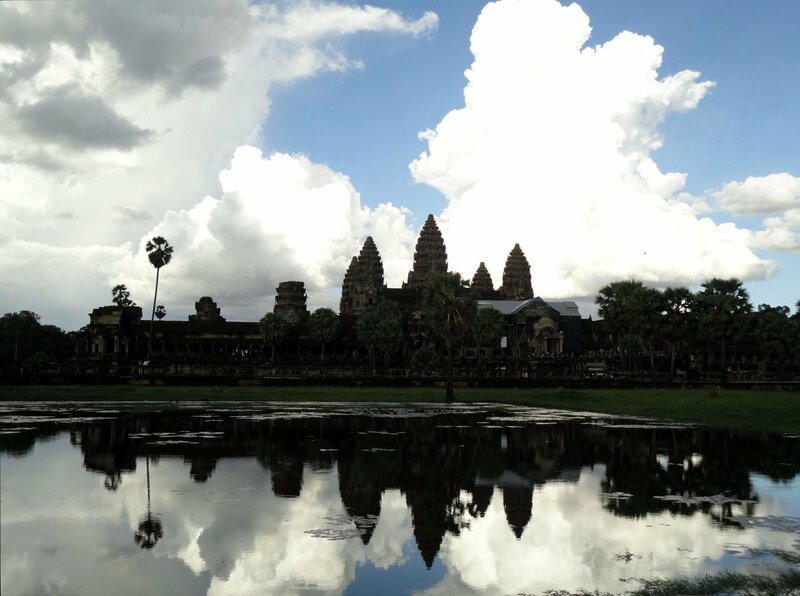 As with Angkor Wat, it has been uninhabited for over 400 years. I entered the ancient city from its eastern Victory Gate and as you approach, you get a sign of its significance. 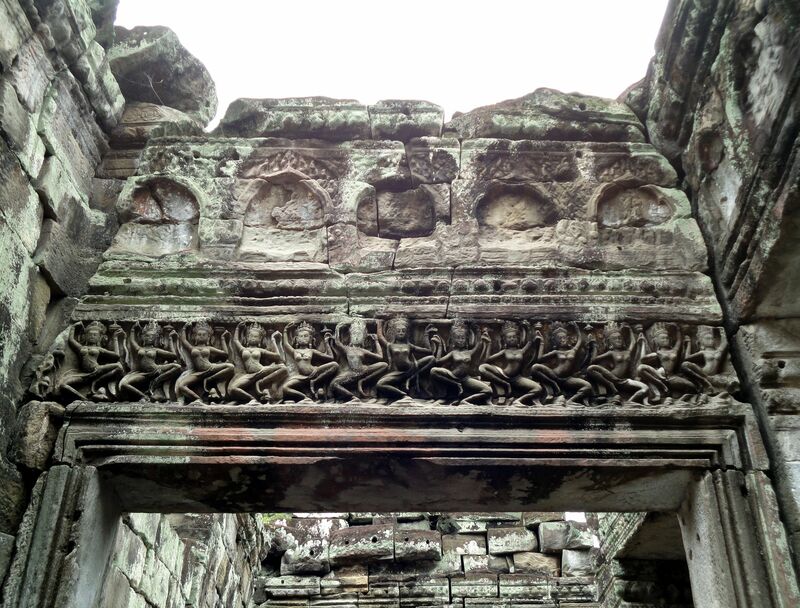 The road into Victory Gate is flanked by two rows of small giants seemingly engaged in a tug-of-war with two nagas (mythical snakes) at the ends, while the gate is topped by a massive stone “dome,” flanked by two smaller ones. 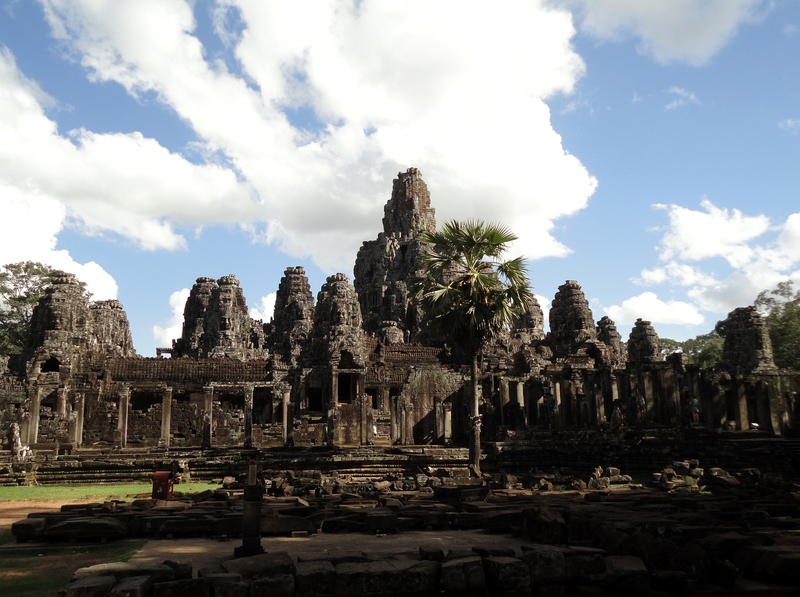 The largest and most impressive structure is Bayon, which served as the state temple and is distinctive for its numerous stone 4-headed statues. 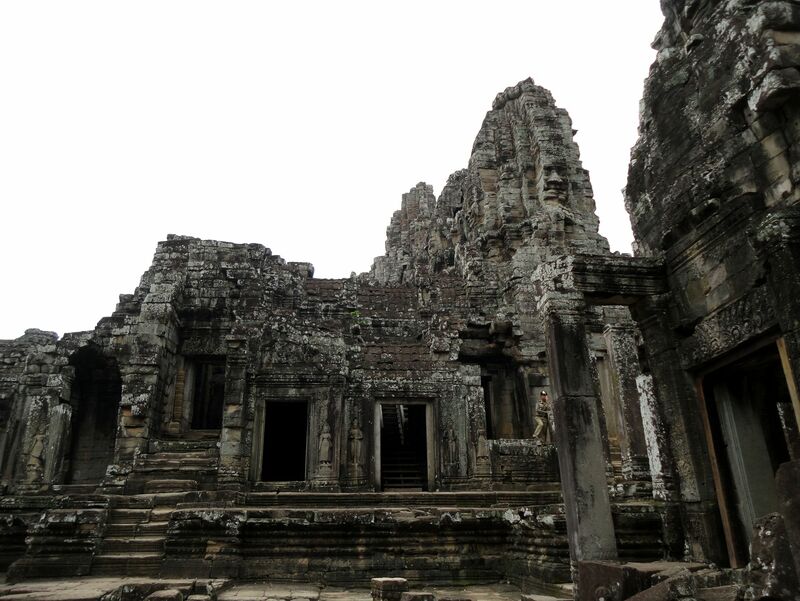 It’s a massive dark gray stone temple-palace with several jagged “peaks” or towers surrounding a giant dome. 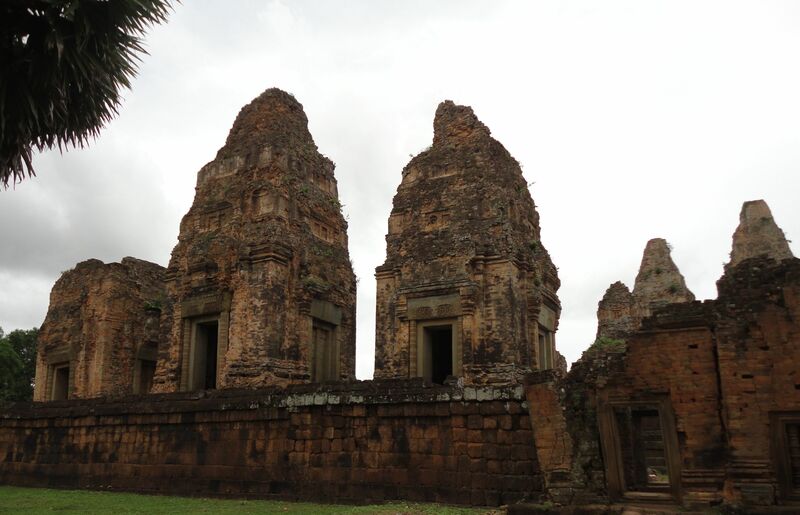 Despite Bayon’s slightly menacing appearance, it’s got a “friendly” ambiance because the towers feature sculpted faces with a smiling or serene expression. Each peak is topped with 4-headed statues, which is somewhat eerie. The faces are said to be modeled on Khmer King Jayavarman VII (builder of Bayon), who probably thought of himself as a god. 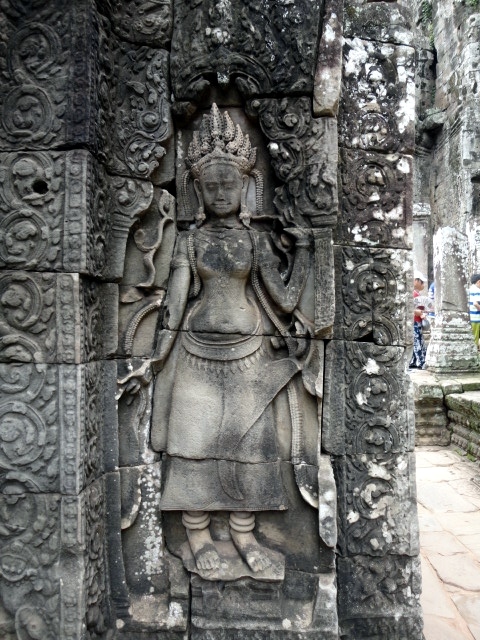 Bayon started off as a Buddhist structure but was altered later when the kingdom became Hindu. 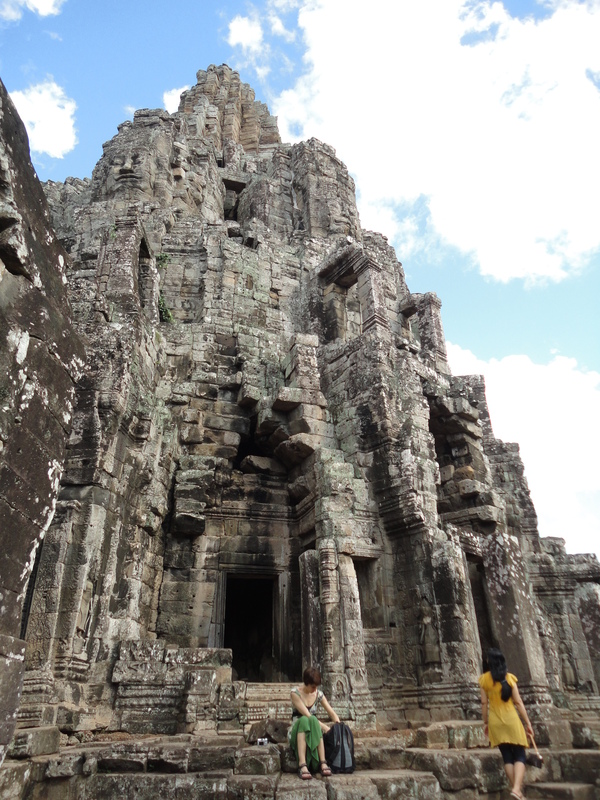 Bayon was so magnificent I visited it twice, on my second and third days in Angkor. 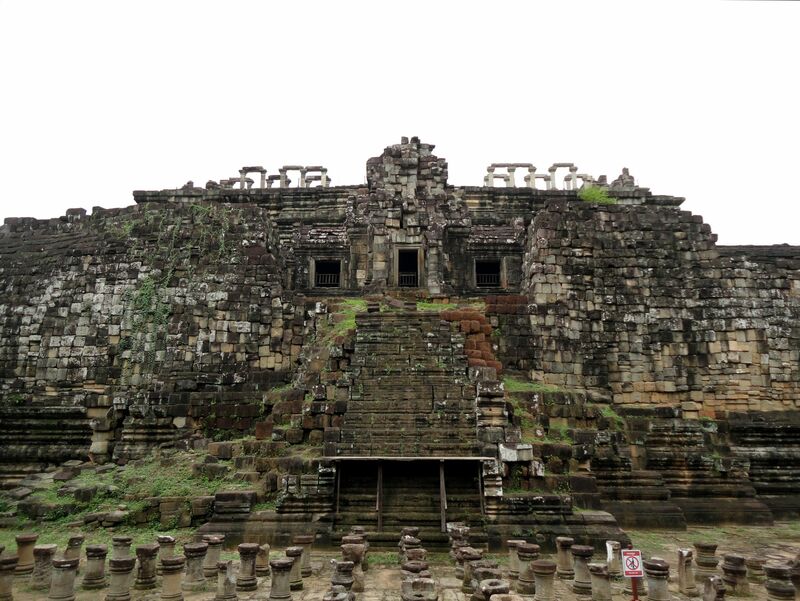 Baphuon is a massive ancient Hindu temple built in the form of a pyramid but a lot of it has been destroyed. 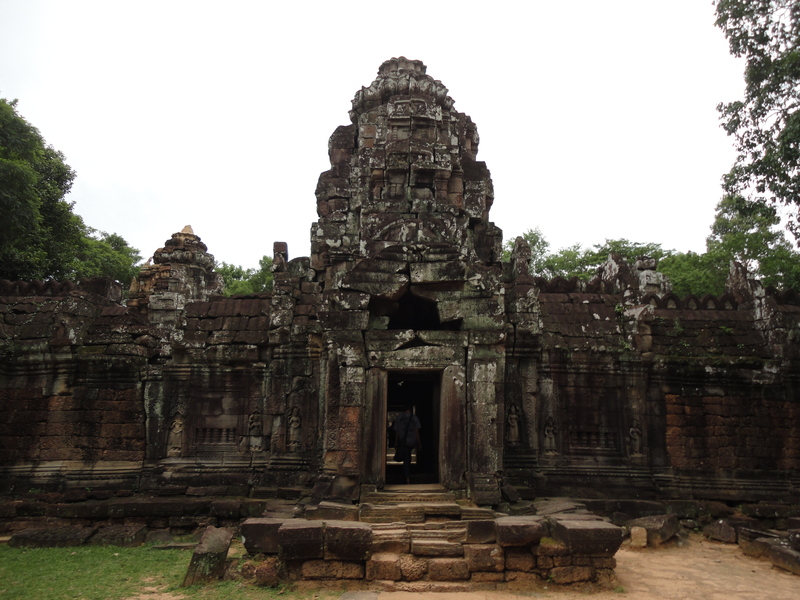 Even so, it is one of the bigger temples in Angkor. 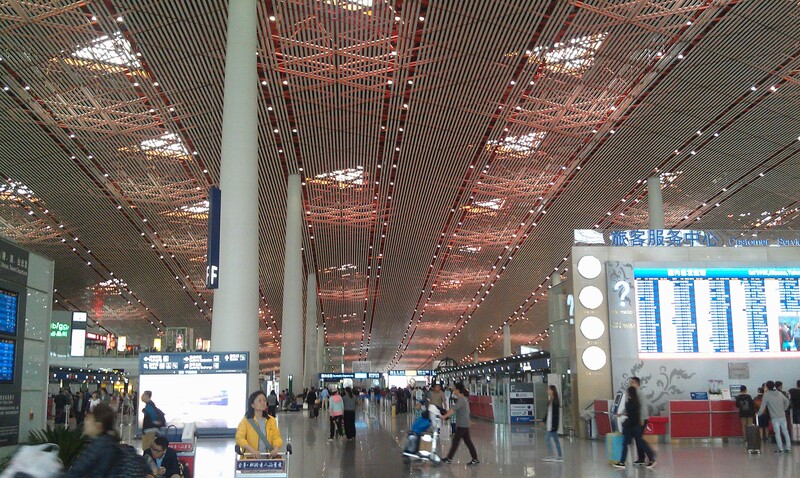 It underwent massive renovations in recent times. 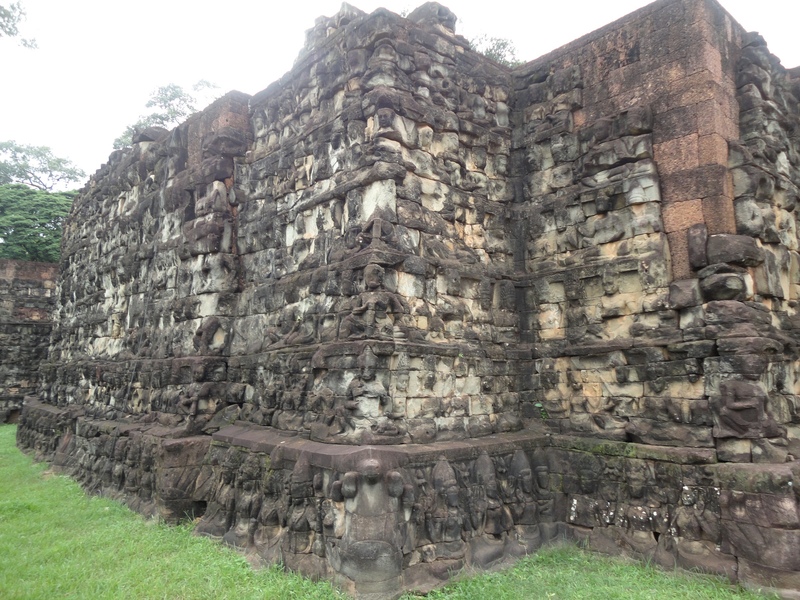 After exiting Baphuon at its rear, there’s a path that leads into a forested area and a wall that you can go through. I was a little apprehensive when I entered this jungle but I trusted from the map that the Royal Palace and Phimeanakas would be there and that it wasn’t that far from the main sites anyways. Unfortunately I was wrong about the Royal Palace, which doesn’t actually exist anymore (I should have realized that why it’s marked as Royal Palace Area on the map), and I kept staring at my map and looking around expecting to see a palace any second. Phimeanakas however did exist, being a pyramid with a flat top that you can climb to the top of via a long wooden staircase. 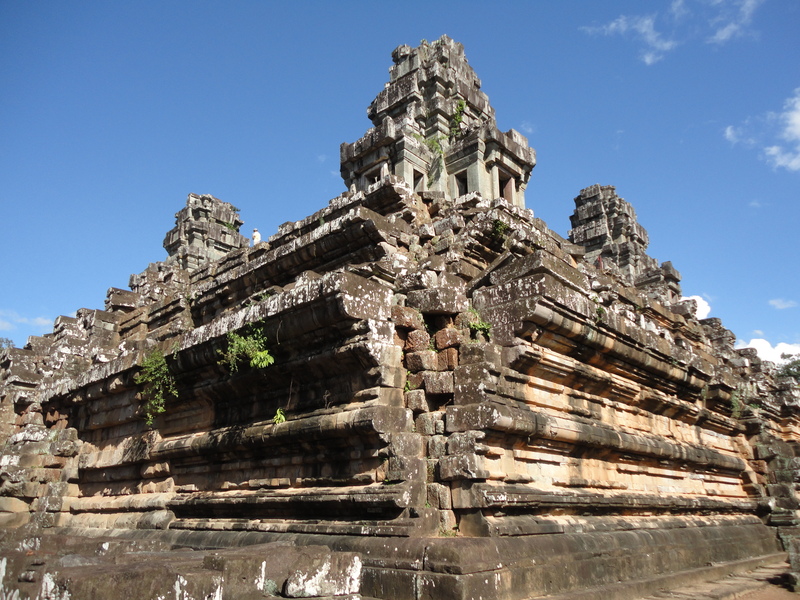 Just like Baphuon, it was a Hindu temple and was built during the 10th century, so it has a history of over 1,000 years. 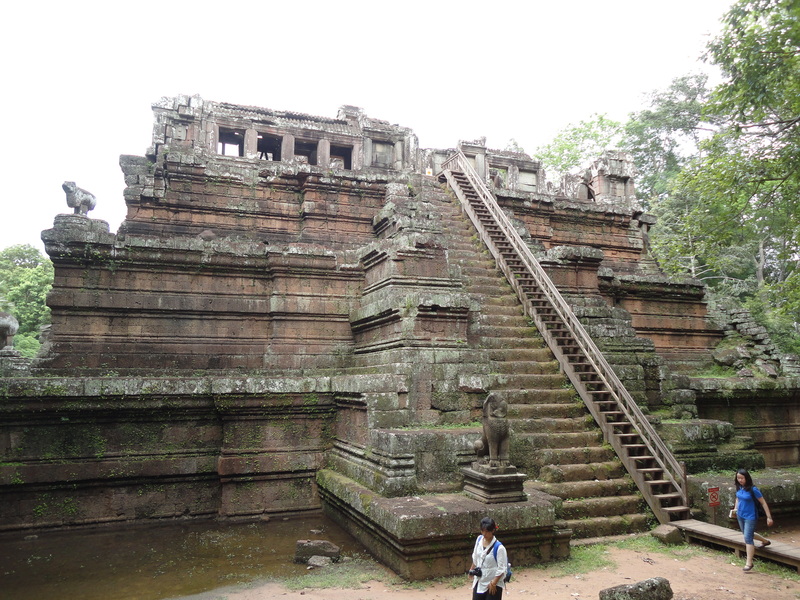 It’s much smaller than Baphuon but it’s a cool sight as a compact pyramid in the middle of a jungle. This was also where I got approached by a young kid who started to act like a guide, which I mentioned in a previous post. The boy was followed by several smaller kids, and we all walked a good way before eventually parting with him asking for a small tip, which I gave. This area is forested but there are small structure and villages inside, which I found out by accident. I thought I was lost at one point until I came upon several soldiers armed with rifles sitting in a village. I was a bit startled and images of being shot or arrested suddenly came to my mind. Of course, I didn’t do anything foolish or suspicious like turn and run. I did something even more foolish which was to take out my map and ask the soldiers by pointing and speaking simple English. Eventually one of them pointed me to the right way. The reason for the soldiers was because of a UNESCO event that night in which some local bigwigs would appear. Along several parts of the road in Angkor, there were soldiers and policemen. 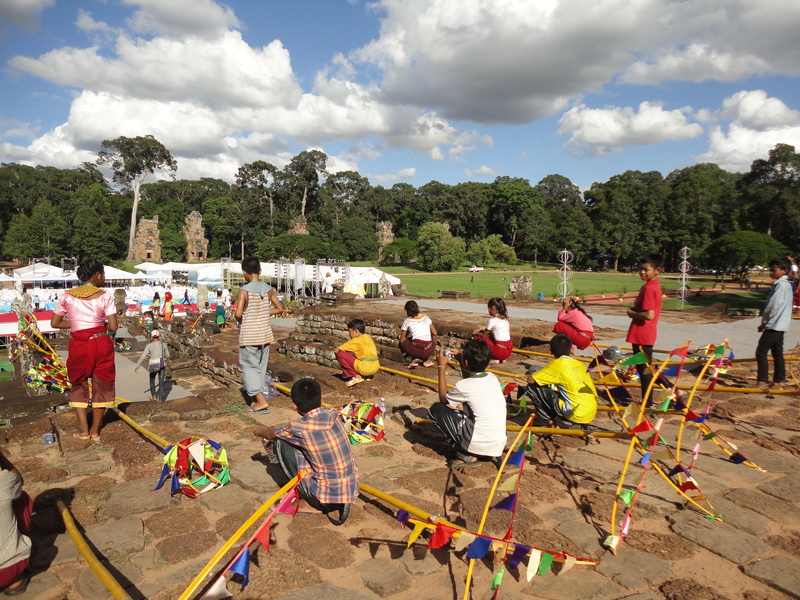 That’s why there was a stage set up with young dancers and performers, as well as tents along the lawn opposite the Terrace of the Elephants, so named for its elephant statues, where Khmer kings would stand and view their armies and subjects. 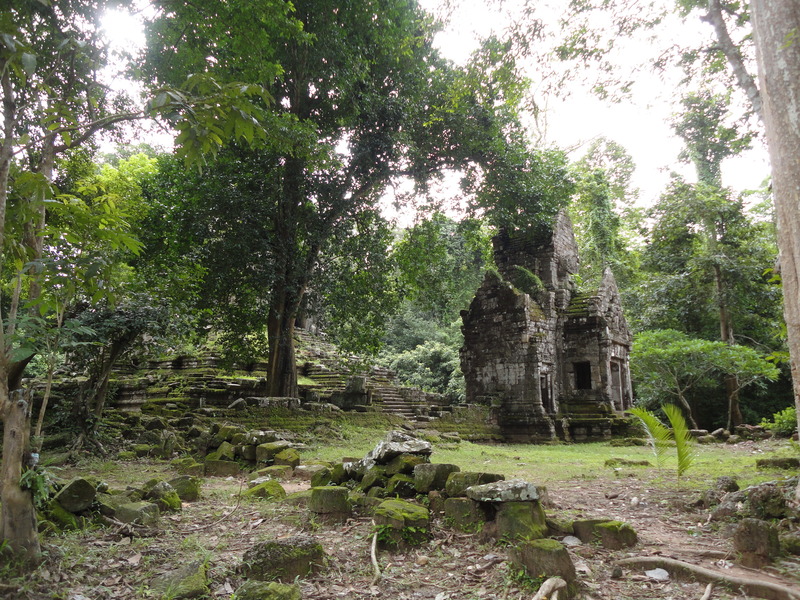 Solitary building in the forested area behind Phimeanakas. Child performers taking a break during rehearsal for the night’s big show. Notice the boy in red standing on the right staring at me. 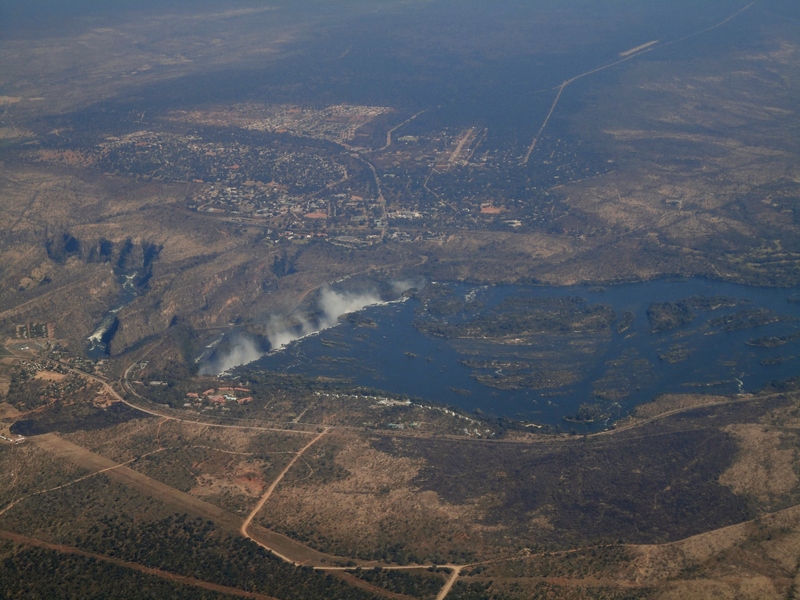 Also, notice those pale-brownish towers in the foreground- those are ancient structures as well. 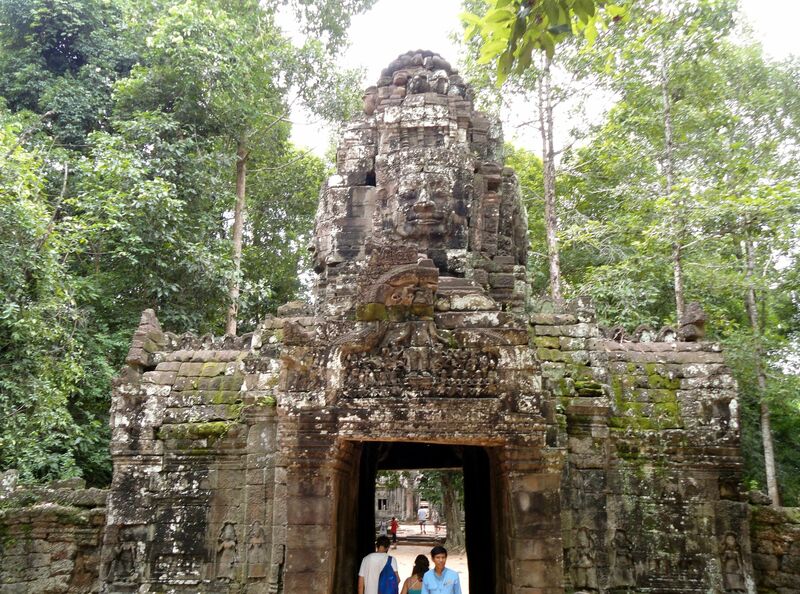 Victory Gate, the eastern entrance into Angkor Thom. Giants engage in tug of war on the two sides of the road into Victory Gate. 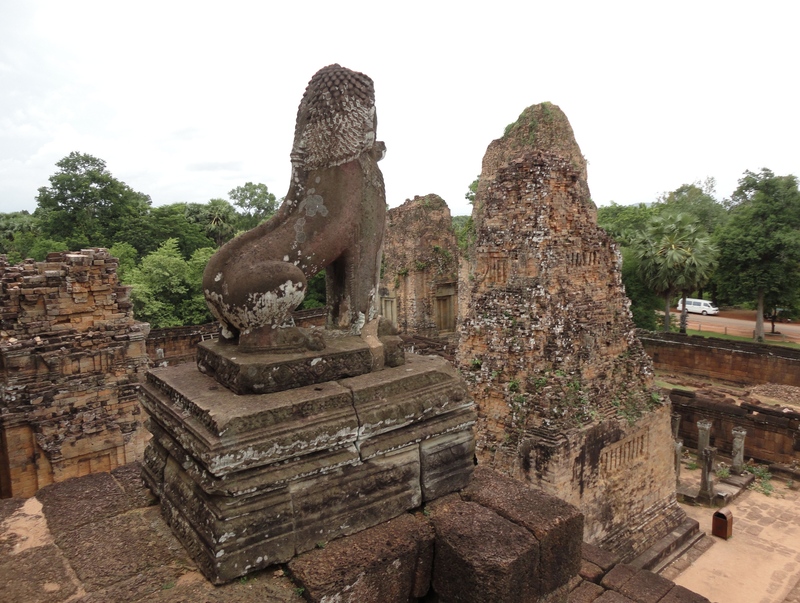 What would Angkor Thom have been like when it was a thriving city? 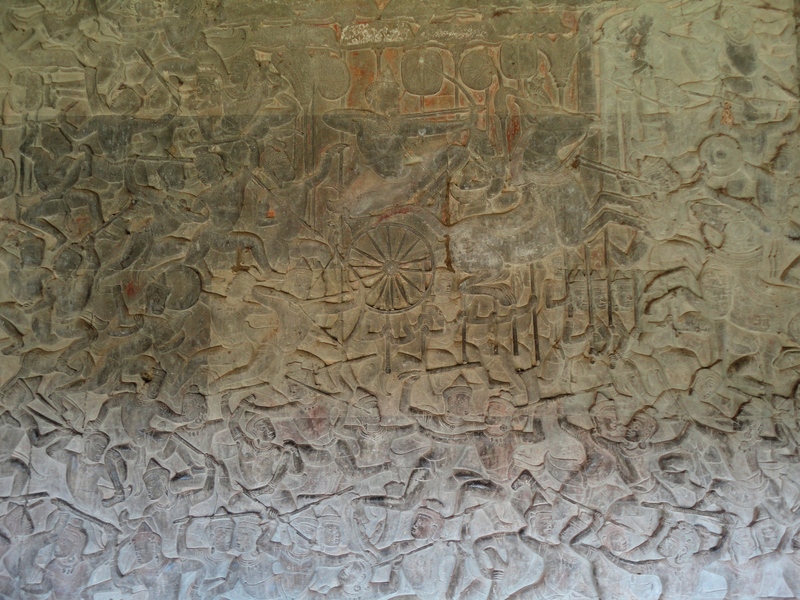 Nicely detailed deity engraved on a wall in Angkor Thom. 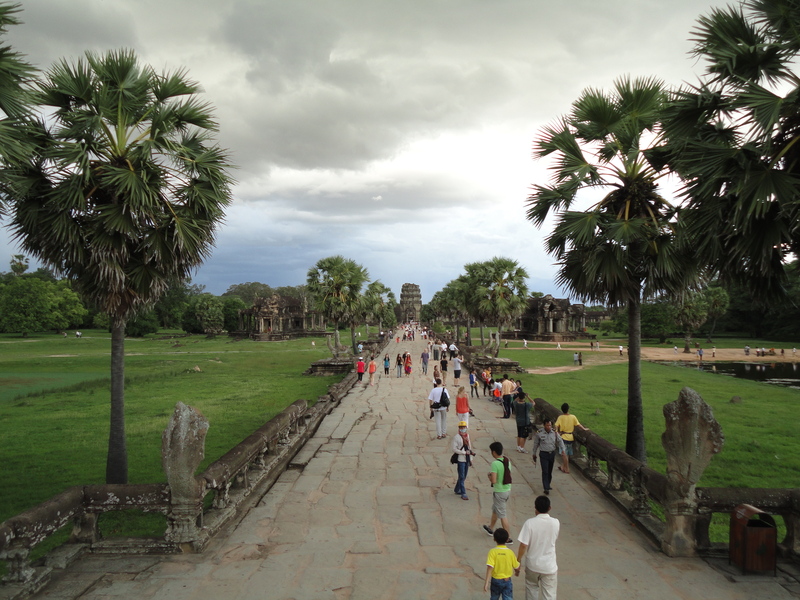 On my third day in Siem Reap, I went to Angkor Wat again. 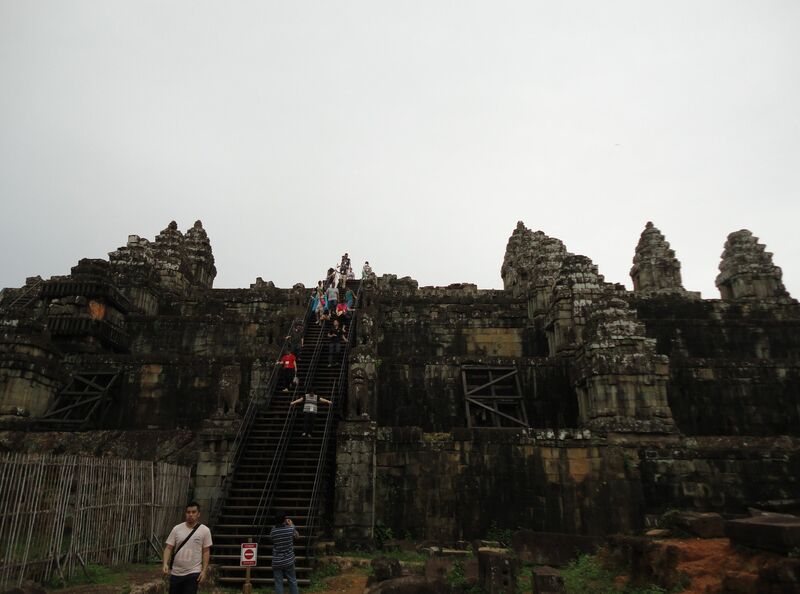 I’d almost wanted to take a break and stay in the city, but then I figured I’d be wasting my time so I went back up to Angkor. I hired a driver on the street, negotiated a price and then set off, this time a little later than the previous two days, which almost proved to be bad. I’ve also listed a few other sites I went to that are not in the other posts. 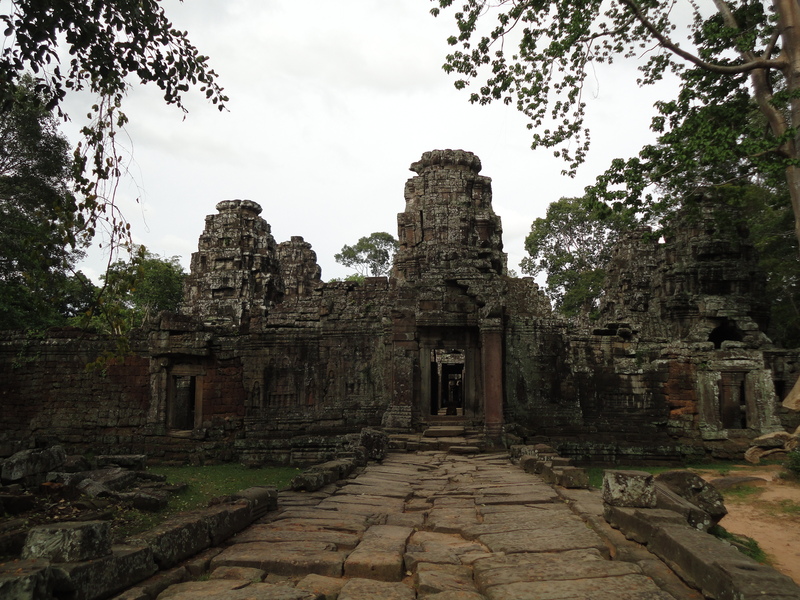 On the third day, besides going to Angkor Wat again, I went to Ta Keo and made a repeat visit to Angkor Thom. 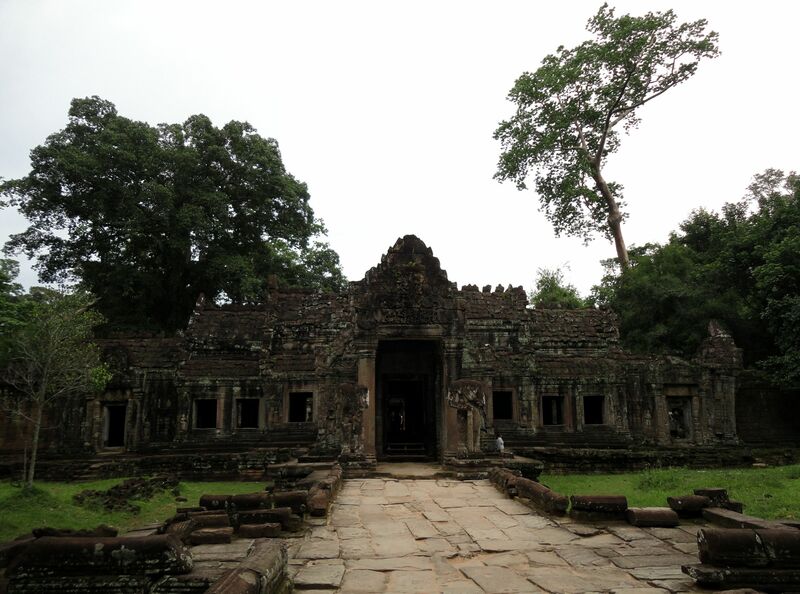 On my first day, the first temple we went to after Angkor Wat was Prasat Kavan, followed by Banteay Kdei. 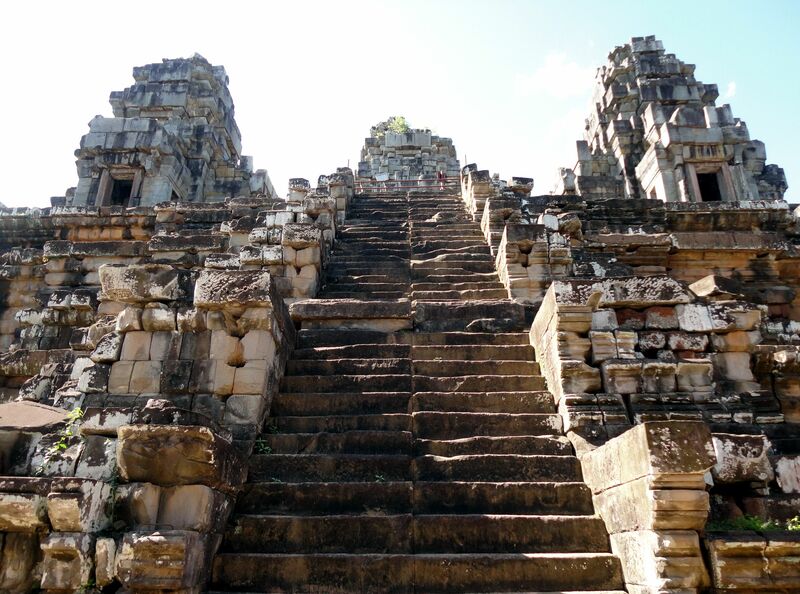 On the second day, my final stop was Phnom Bakheng, a temple located on a small hill right outside of Angkor Thom to the south. My second visit to Angkor Wat started off well. The day was sunny and there weren’t many visitors. 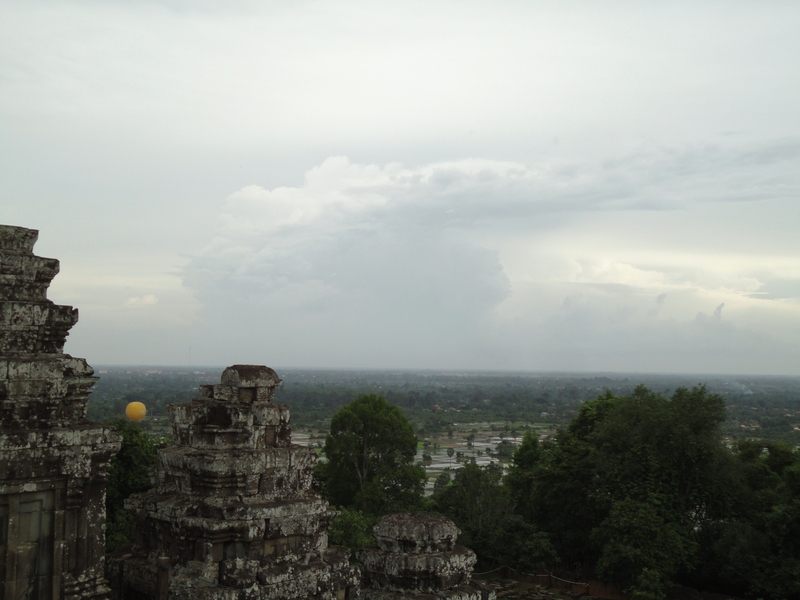 I went back to the highest point of Angkor Wat and I took more photos of Angkor from beyond the pools. While I was there, a couple asked me to take a photo of them, then complimented me on my shirt, which was a New Zealand t-shirt that my mother had bought me when she went there for a holiday. The couple turned out to be Kiwis and they took my photo for me in return, before we parted ways; the second time on my Southeast Asia trip that New Zealanders had seen my shirt and remarked about it to me. Somehow while I was inside, clouds appeared on the horizon, followed by a little rain. By the time, I walked towards the entrance the rain got heavier and eventually began pouring. I decided to wait but after 20 minutes or so, I took out my umbrella and walked back to the entrance where my driver was. 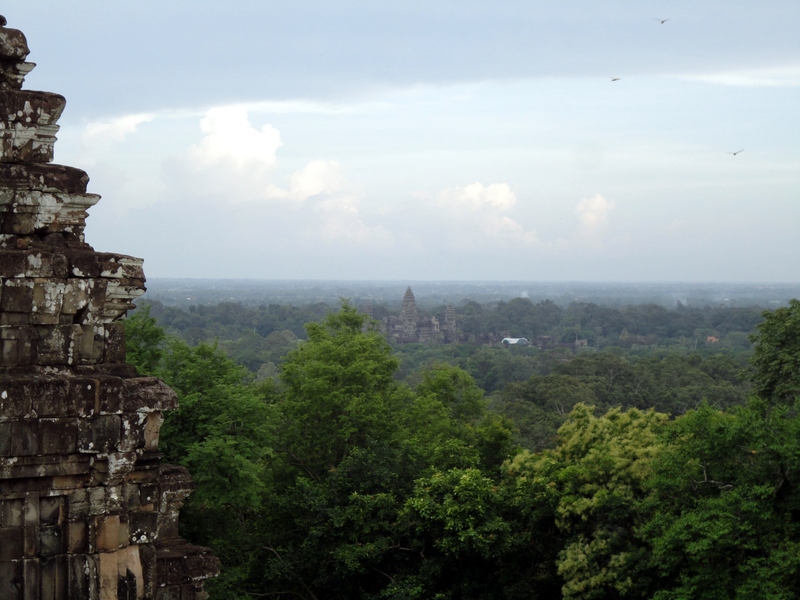 I made sure to look back at Angkor Wat and take one last pic, the one at the top of this post. 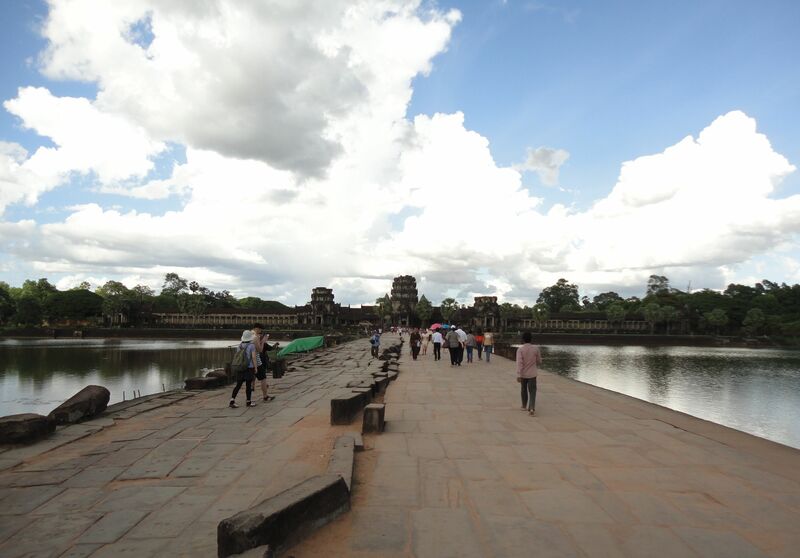 The very wide moat that runs along Angkor Wat’s outer walls. 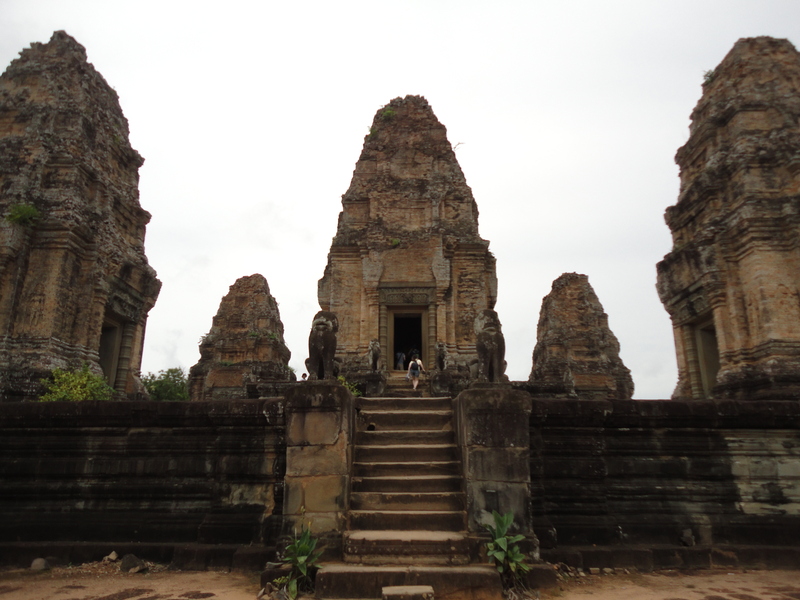 Ta Keo is an imposing temple that stands several stories above a massive stone base. You can climb to the top, where three large domes are, and enjoy the views of the surrounding forest. 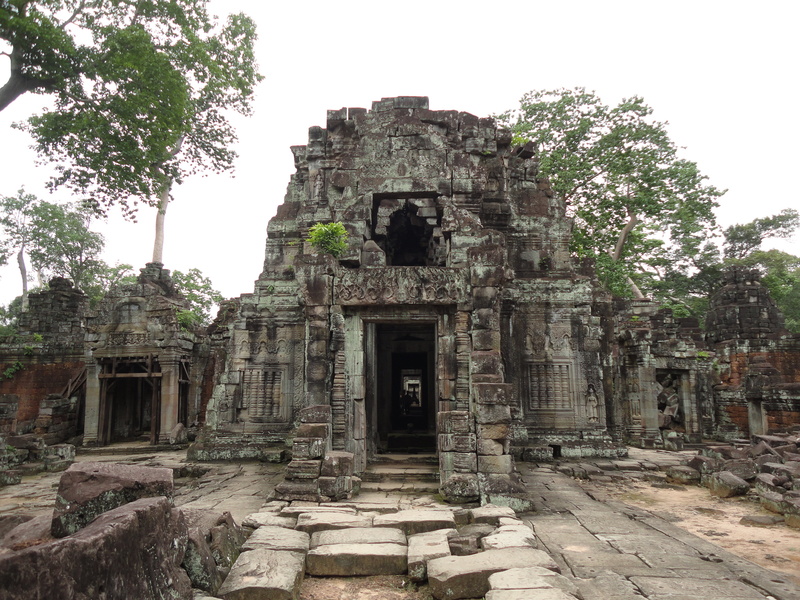 Prasat Kavan was quite simple, basically a shell of a temple with only the pillars and center dome intact, whilst missing the roof and outer walls (if there had been). 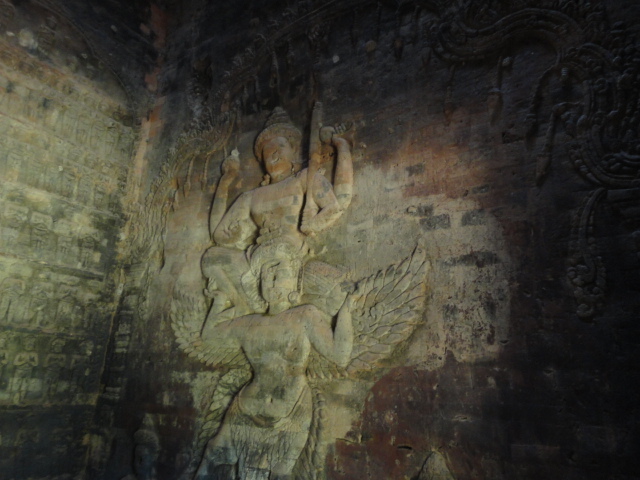 It did have some cool engravings of deities on walls inside a few rooms. Banteay Kdei is a long, one-story, grayish temple ruin, but with a distinctive front entrance that was topped by a massive smiling four-face statue. There are at least two separate buildings, along with piles of columns that somehow reminded me of ancient Greece (not that I’ve ever been there). 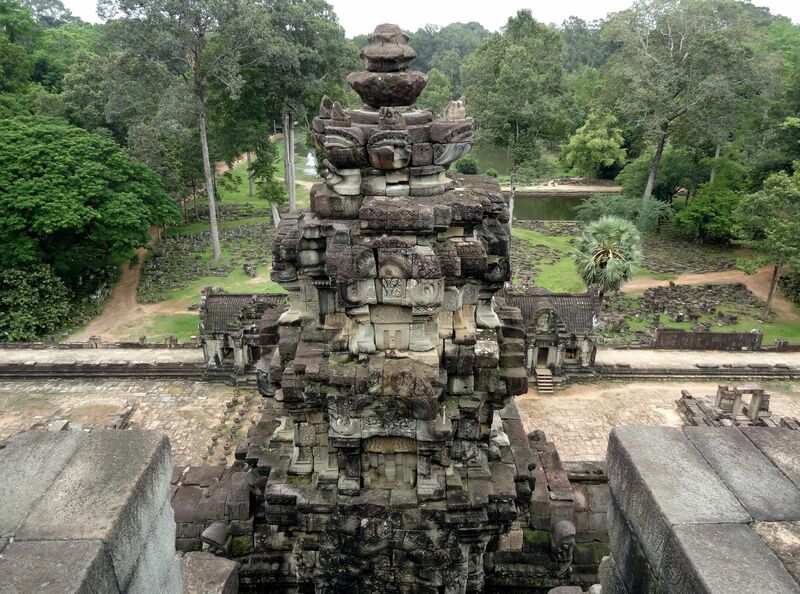 Phnom Bakheng is a Hindu temple ruin located on top of a hill that is just south of Angkor Thom. 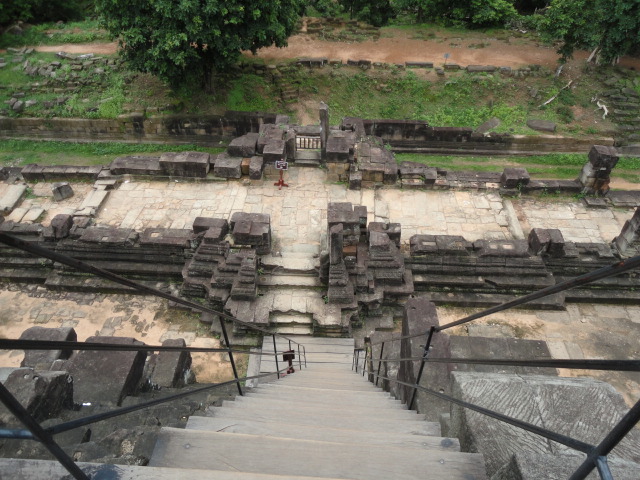 The hike to the top only takes about 20 minutes but there are elephants at the bottom that can take you up for a fee. 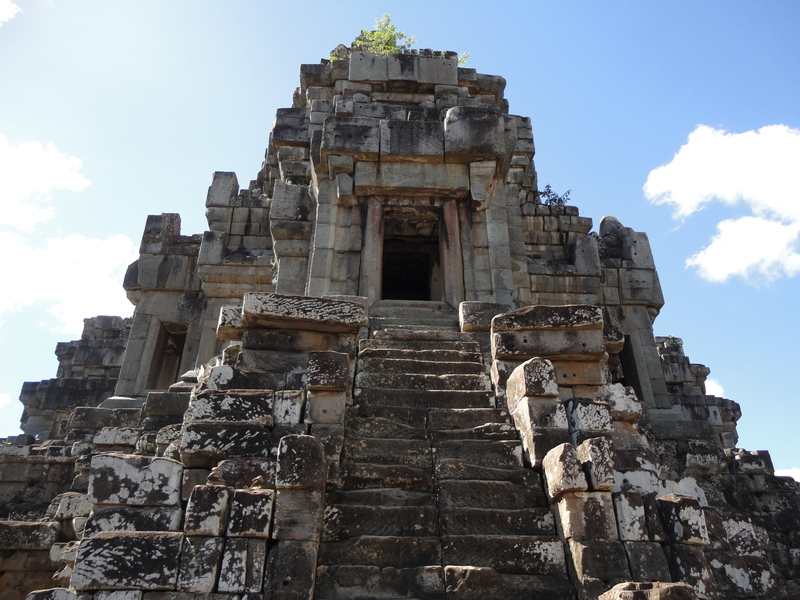 At the top, the temple has a flat top that gives you good views of the surrounding forest, baray (reservoir) and glimpses of Angkor Wat. 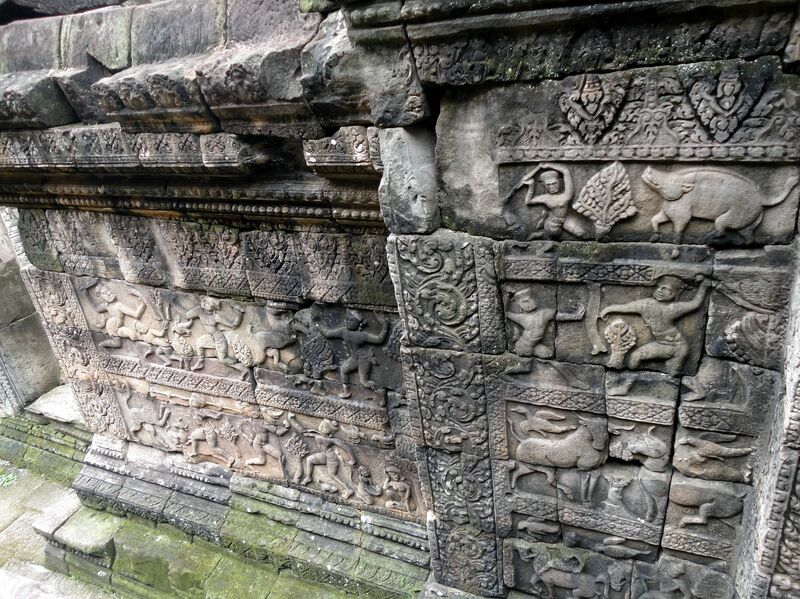 Interestingly, Phnom Bakheng is over 1000 years old, predating Angkor Wat by more than 200 years. 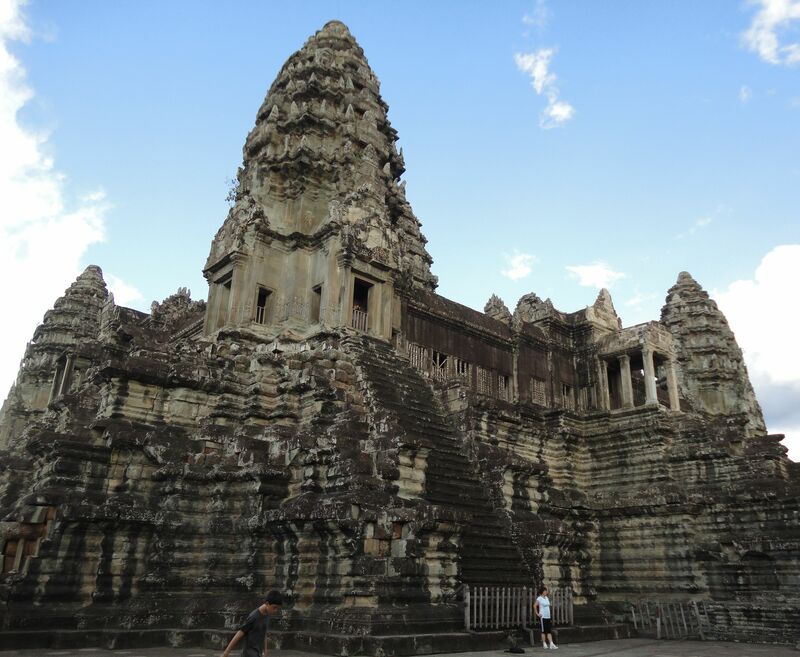 Angkor is full of great ancient sights besides Angkor Wat, especially Angkor Thom and the “Big Circuit,” a loop which takes in several major sites to the northeast of Angkor Wat. 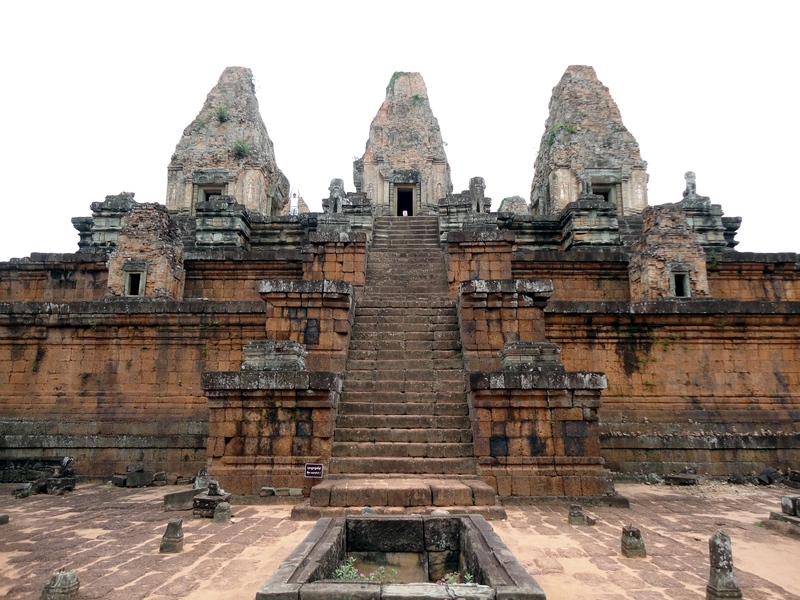 I went to these places on the second day but unlike my first day when I rode to Angkor with several Chinese, this time I went solo on a tuktuk I hired back in Siem Reap. The driver was a nice, middle-aged guy who I also hired to drive me to the airport on my last day. However, I had to endure an uncomfortable experience in the morning just before I met him. As my Chinese friends had gone to see the sunrise at Angkor earlier that morning, I went out to eat “brunch” and find a driver myself. I passed some guys near the corner from my hotel and I asked them about prices. I tried to negotiate with a guy but I wasn’t satisfied so I decided to move on. The guy wasn’t pleased and he proceeded to followed me. As I walked along the road, I hailed another driver and he stopped. I told him my itinerary which would mainly be Angkor Thom and several temples on the “Big Circuit” and he gave me a lower price than the previous guy. I agreed, but right then, the previous guy came up and started to complain. Interestingly, he didn’t challenge or try to scare away the other driver, which was good, though he stood nearby glaring at me. As soon as I continued towards a restaurant, he started following me and protesting. “Why you do this? You come to my country and you do this. Why you [take your business away]?” he kept saying. Finally I had enough and I shouted back, “I didn’t promise you anything!” I was worried he would pick a fight but luckily when I went into a restaurant, he went away. I was a bit shaken, though now I could safely say he was probably desperate rather than malicious. The other driver had parked nearby and gave me a ride (free) back to my hotel, where I got my stuff then came back out for my second trip to Angkor. The rest of my trip went well as I was carried around in comfort on the motorized tuktuk, in contrast to the previous day when my malfunctioning bicycle wheel and hot sun combined to make me exhausted and lightheaded. As I’d already bought the entry pass the previous day, the driver took another road into Angkor that passed through some rural land. 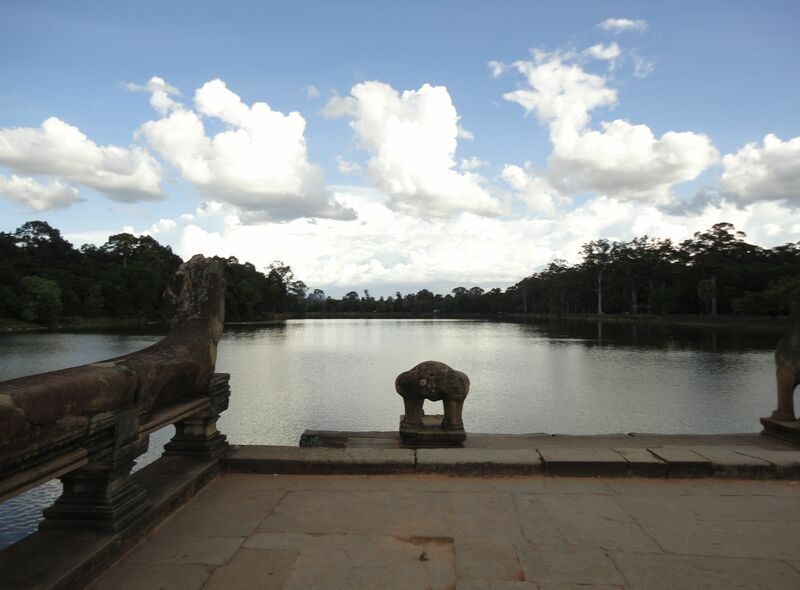 I started at the Sras Srang reservoir, then red Pre Rup, East Mebon, Ta Som, the artificial island of Neak Poan, the ruins of Preah Khan before going into Angkor Thom. 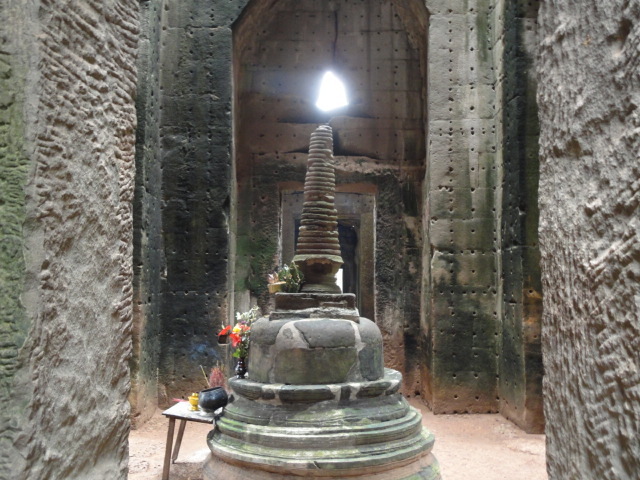 The first temple was Pre Rup with its tall, reddish distinctive cone-topped domes. 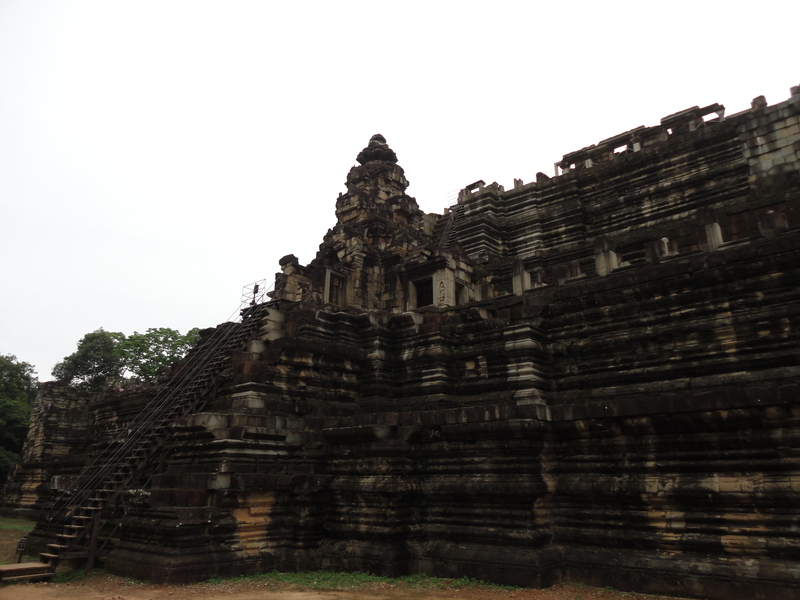 It was an impressive site and gave off a different vibe from Angkor Wat. Then it was on to East Mebon, which is similar to Pre Rup, but for its elephant statues (which I did not get good photos of). Ta Som provided a change in scenery, being a one-story temple featuring a long passageway passing through multiple enclosures/gateways and a central shrine. 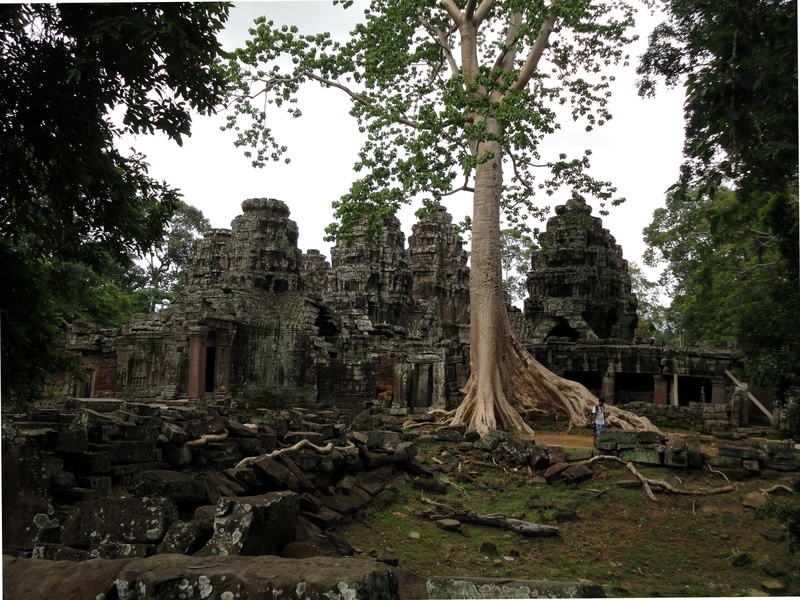 It was a bit similar to Ta Prohm. After three buildings, it was time for a change- Neak Poan, a small temple on an artificial island in a swamp-like reservoir. You get there by walking on a long wooden boardwalk towards a pit. 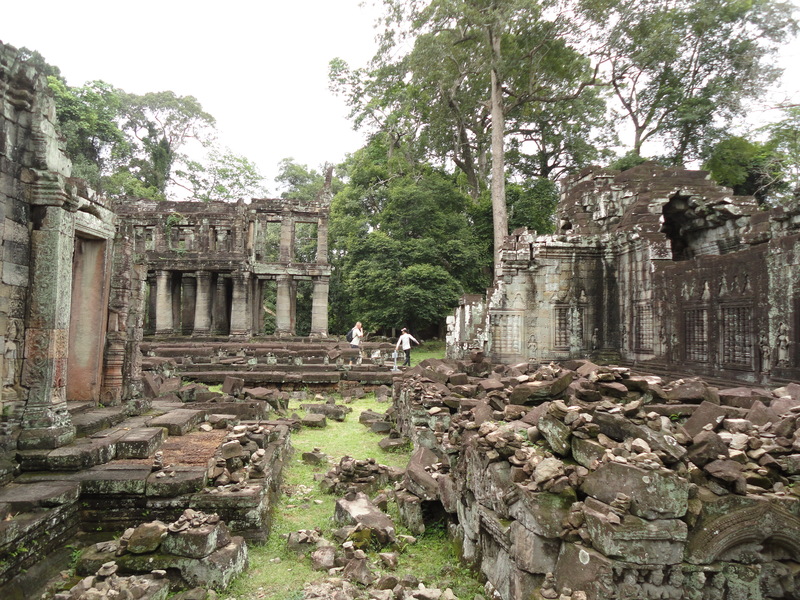 The last temple before entering Angkor Thom was Preah Khan, which was filled with ruins, lots of open area, long passageway. It was great to go inside and explore all these temples but there was one small issue – the persistent vendors and hustlers. 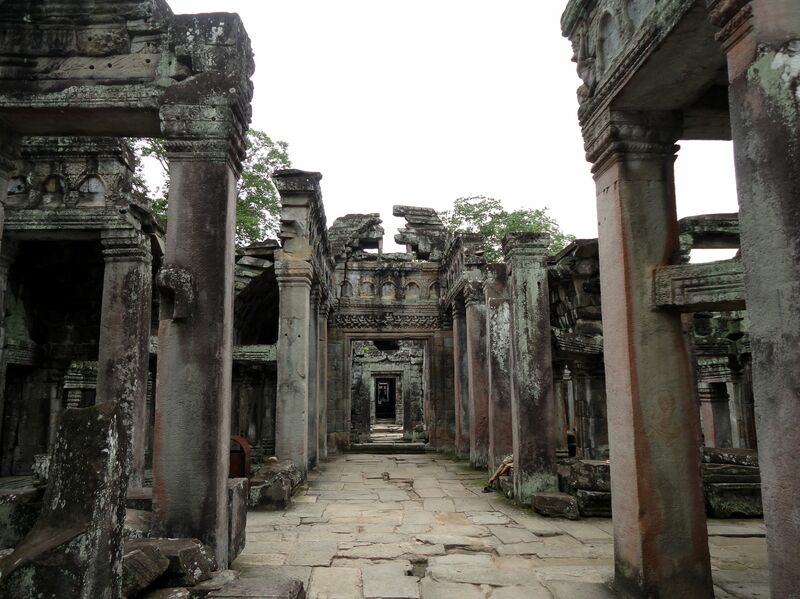 Inside Angkor, there are villages and a lot of people make their livelihoods from visitors. Some set up stalls along the roads and near the sites inside Angkor, while some individuals try to sell books or even wooden instruments from bags. A few act as unofficial guides (the official ones wear badges) and try to latch on to you for $1 or more as you go inside the sites. Most of the time, it wasn’t bad, even a bit amusing. At a souvenir stall in front of the Sras Srang reservoir, a girl came up to me. Just like that, she gave me a light bamboo woven bracelet and told me it’s a free gift but that I had to buy something. I tried to give it back but she jumped back, saying that “if you give it back, it means you don’t like me.” Since it was the start of my day, I didn’t need to buy any water or any souvenirs so I didn’t buy anything from her, but now that I think about it I should have, if only to be nice. I still have her bracelet, a reminder of her entrepreneurial flirtatiousness and my stinginess. There were a lot of child vendors and while they can be cute, it is hard to have to keep ignoring them or telling them no since I didn’t want to buy their postcards and trinkets. However at one site, there were a few child vendors, with the youngest a toddler or 3-year-old vendor. This very little one was so young he could only say “one dollar” and not even fully, while holding a few postcards. And because he was so little, he didn’t hassle or follow you like the older kids, but just stood to one side. It’s kind of cute, but it is also worrying to think that h might grow up to be follow in the footsteps of those older child vendors. Inside another temple ruins, I saw a heartbreaking scene with another tiny child vendor. There was a European family with two young kids and the little vendor walked up to the younger white kid (maybe around 2). It was a stark contrast – the brown Cambodian 4 or 5-year-old selling stuff standing next to a 2-year-old European boy traveling with his family. It might have made for a cute photo but what happened is the mother saw this and quickly took her son’s hand and pulled him away from the little Cambodian. You can see the mother leading her child away from the little vendor (far left) in the photo below which I took about a minute after it happened – I was actually trying to take a photo of the building and tree but by coincidence I saw the above event unfold. It seemed like the mother was apprehensive about the Cambodian kid being near her own child, and it did seem a bit haughty, but to be honest, parents have to be very careful with their kids and can’t be concerned about political correctness. I also encountered some hustlers, both adults and kids. One guy came up to me inside a temple and started pointing out different spots to take good photos. Then he wanted to lead me to other places inside the temple (I did feel a bit worried but he was smaller than me and didn’t seem like a thief) and describe interesting features. When I started walking off, having thanked him, he asked me for a dollar or two which I don’t think I gave him. I mean, it’s no big deal but it is annoying and it’s a bad precedent. 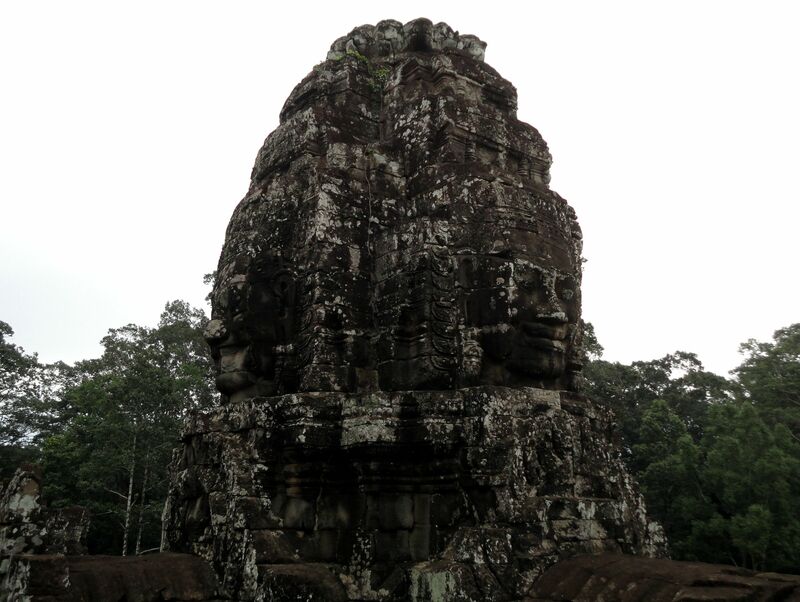 At another site inside Angkor Thom, a young boy started following me and telling me about the history, in decent English. He was about 10 or so, followed by a few other kids, and he was with me for about 8 minutes as we walked across forested area (again I did feel a tiny bit worried, not so much of him, but of whether other people would suddenly come out). As expected, he asked me for something and I gave him $1, since I felt a little admiration. I complimented him on his English and urged him to keep studying. If you’ve made it all the way to here, good for you. 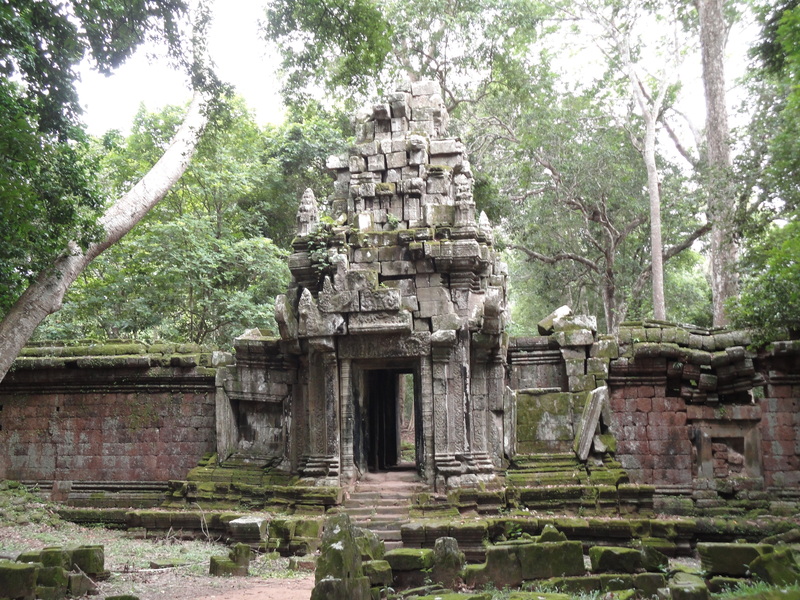 Enjoy this bonus photo of a small standalone structure outside of Preah Khan.